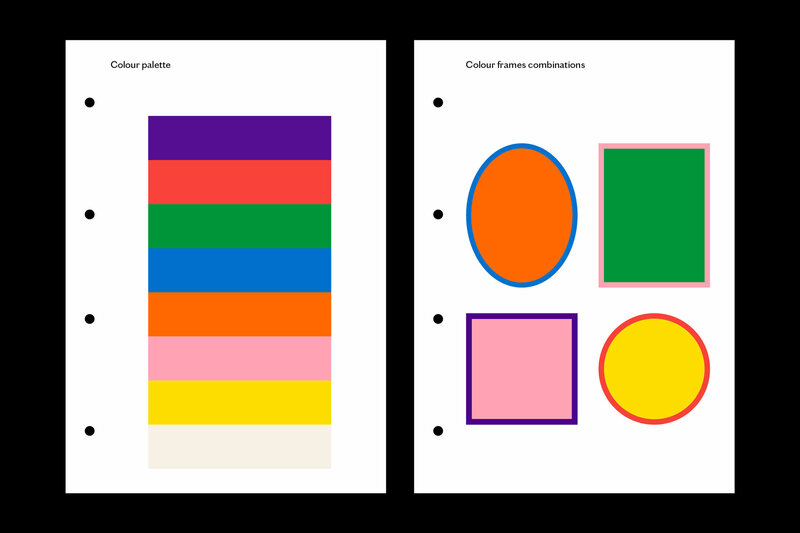 Studio Bergini – Studio Bergini is a London-based graphic design practice formed by Kristian Hjorth Berge & Francesco Corsini. 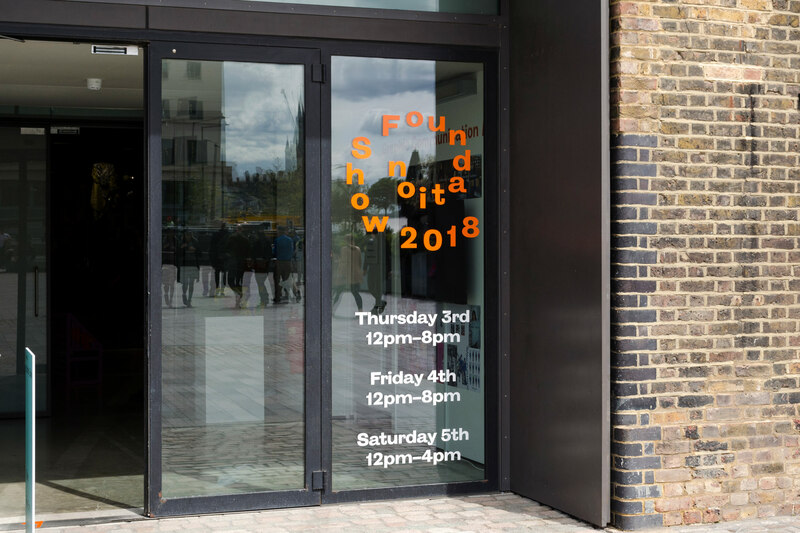 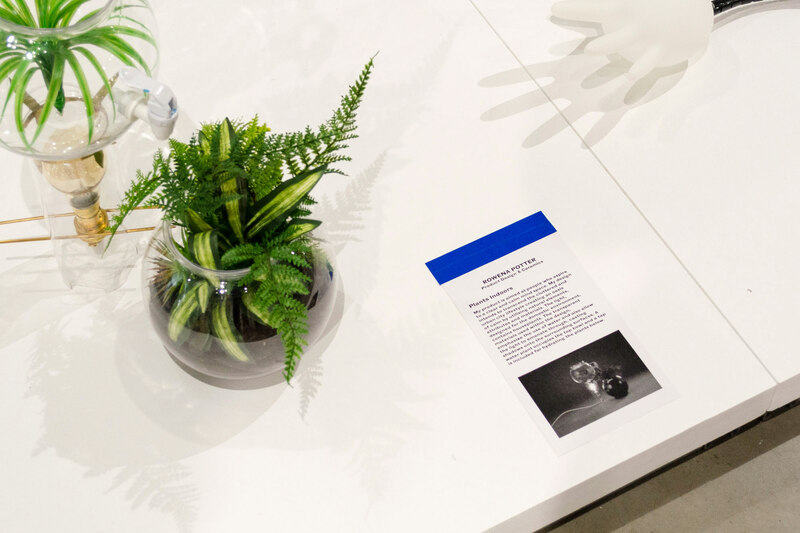 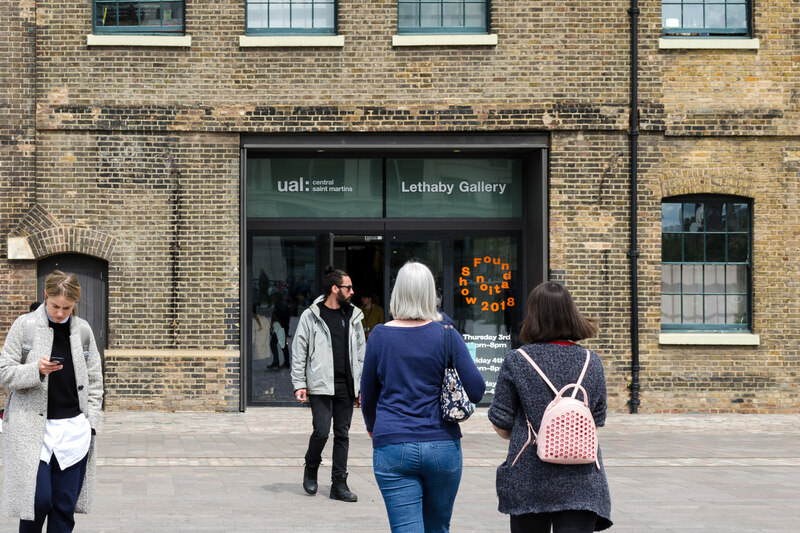 For the CSM Foundation show of 2018, the course wanted to present an exhibition that, rather than focusing on each student’s individual work as in a typical degree show, would instead give an overview of the course. 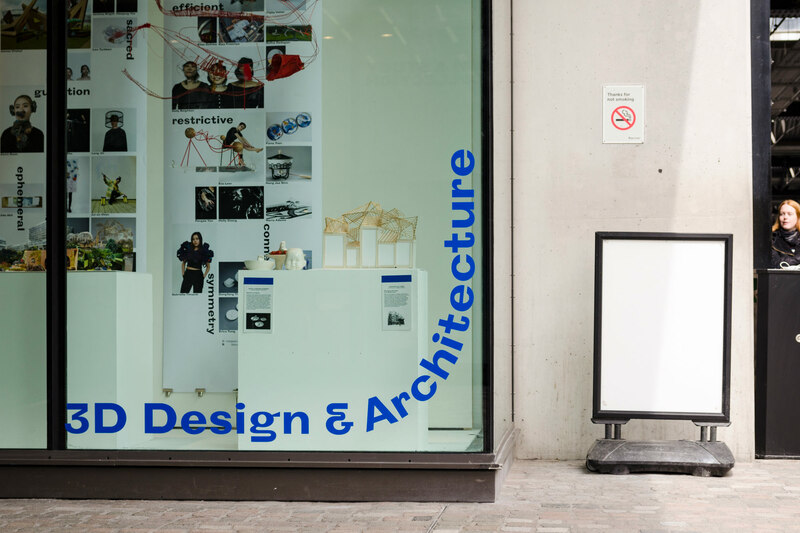 It was curated by Emma Tod and Gary Colclough, and the exhibition graphics done by Studio Bergini. 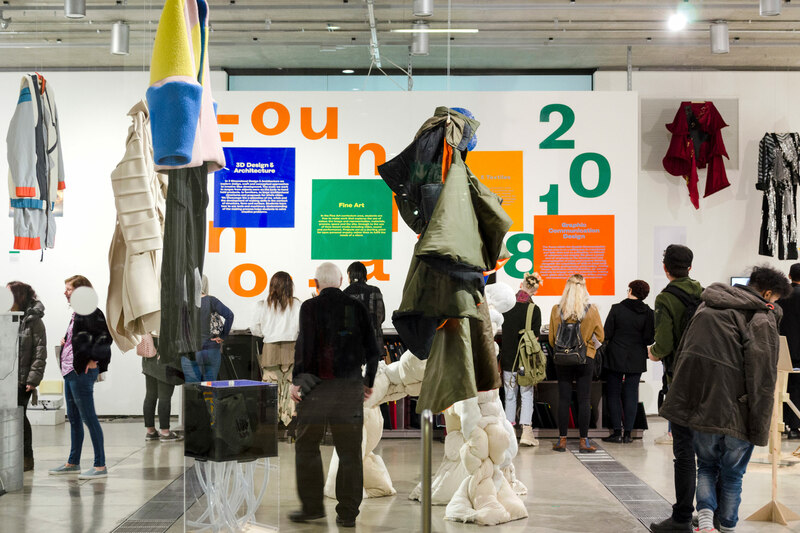 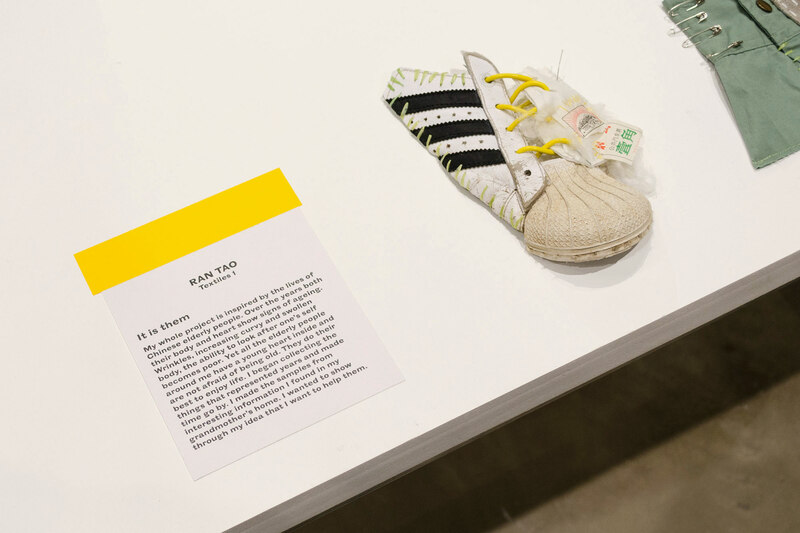 The exhibition was colour coded to indicate the four subject areas of the course; Fine Art, Fashion & Textiles, 3D Design & Architecture, and Graphic Communication Design. 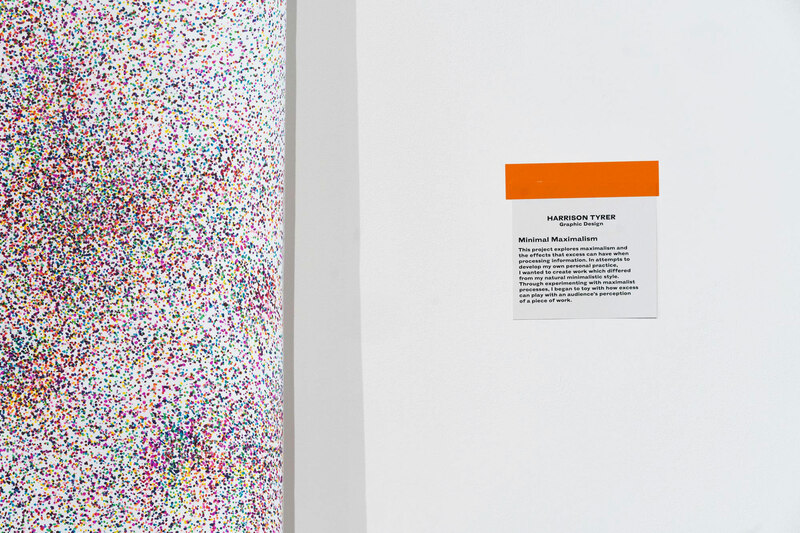 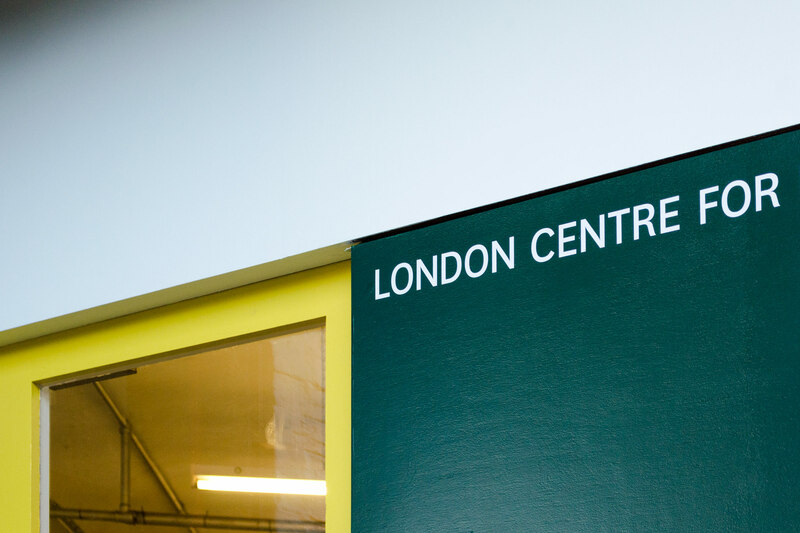 The colours were used for the course descriptions at the centre of the space, and were reflected in the coloured vinyl stickers used for the labelling system around the gallery. 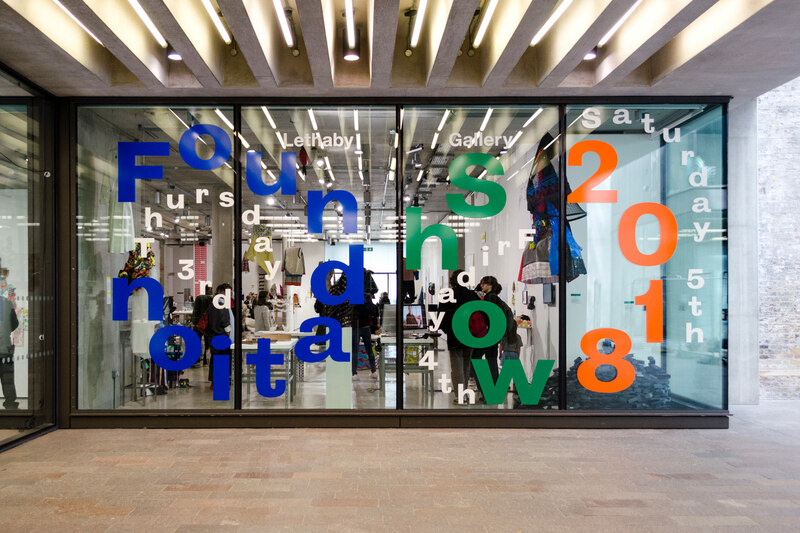 To communicate the playful, experimental, bold, and “in progress” spirit of the Foundation course, we developed a display typeface for use around the exhibition. 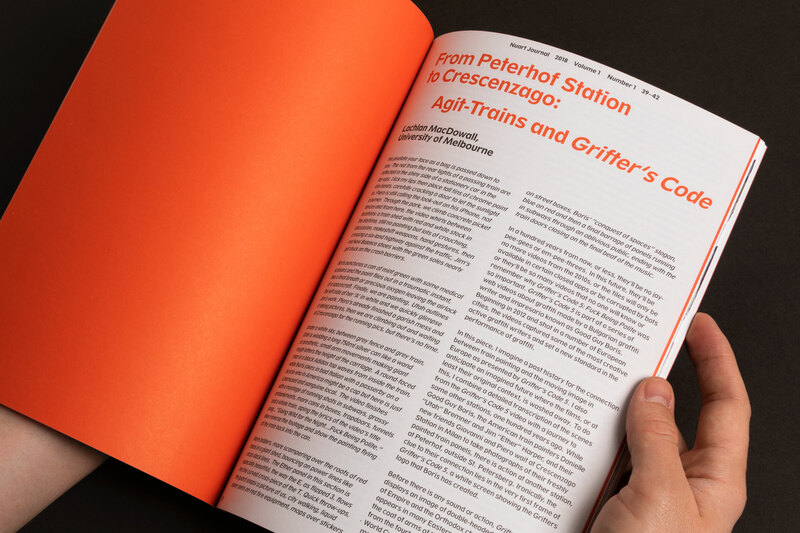 Grotesqini was created by combining features of various old grotesque typefaces, which then were combined and redrawn to create a single font with a lot of playful character and a feeling of being a bit rough around the edges and unfinished. 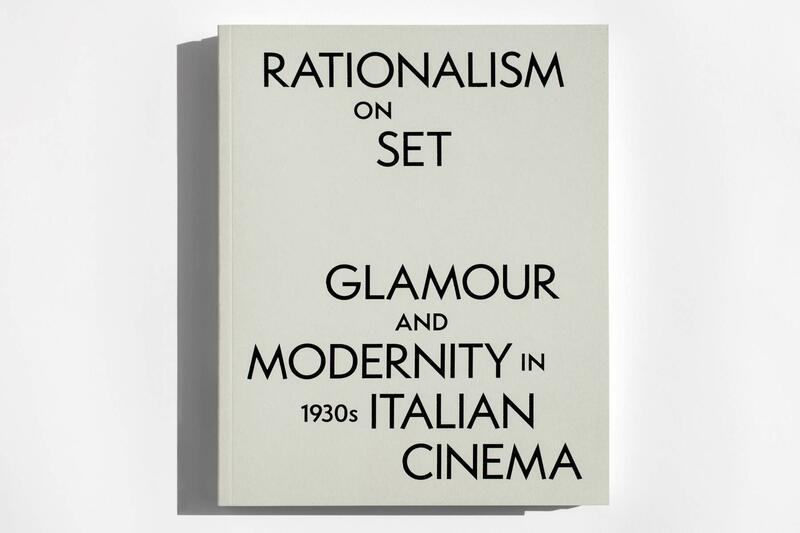 Rationalism on Set: Glamour and Modernity in 1930s Italian Cinema was an exhibition at the Estorick Collection in collaboration with RIBA, exploring a little-known period of Italian cinematic history, highlighting the strong Modernist influence apparent in the set designs created for a number of romantic comedies during the inter-war years. 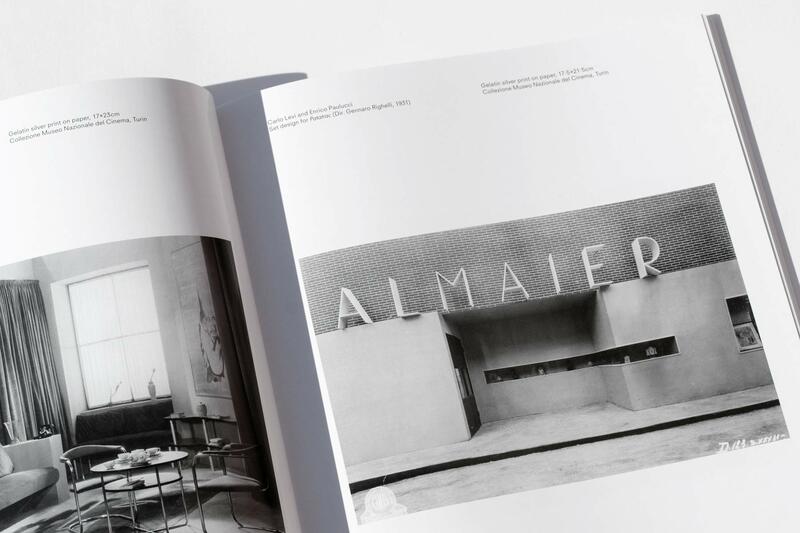 A selection of vintage photographs were complemented by sketches and contemporary periodicals from the Cineteca Nazionale, Centro Sperimentale di Cinematografia (Rome), the Cineteca di Bologna, the Museo Nazionale del Cinema (Turin) and the RIBA Collections. 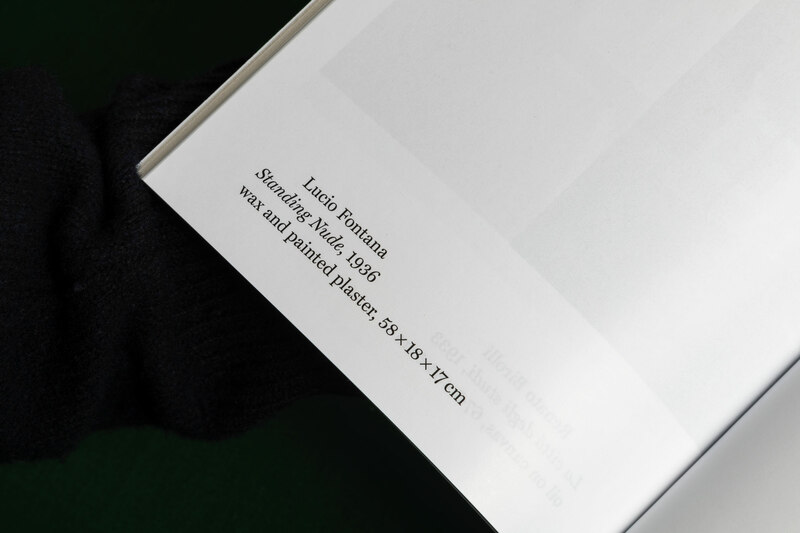 The catalogue makes use of three different paper stocks to separate the featured essay, photos, and sketches. 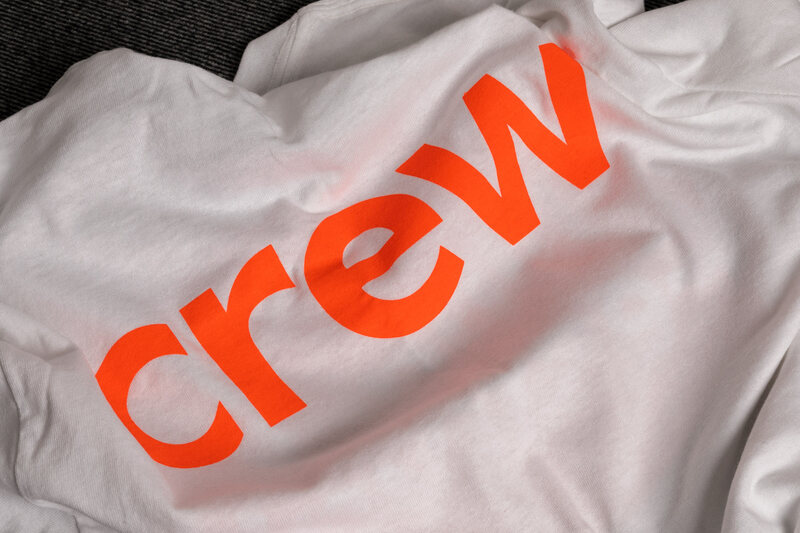 The type is our interpretation of a popular typeface contemporary to the period. 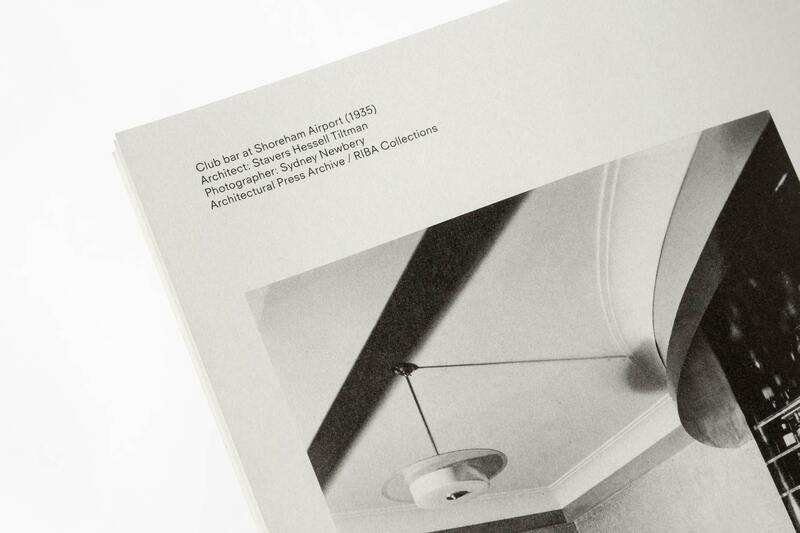 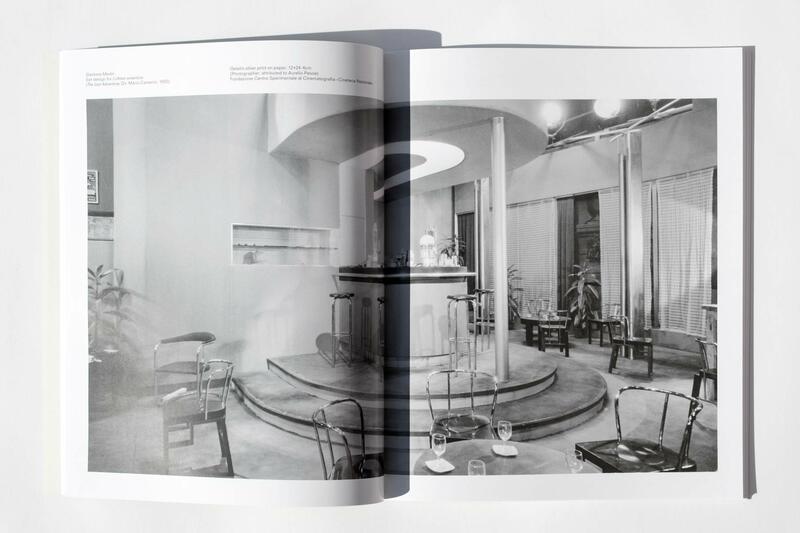 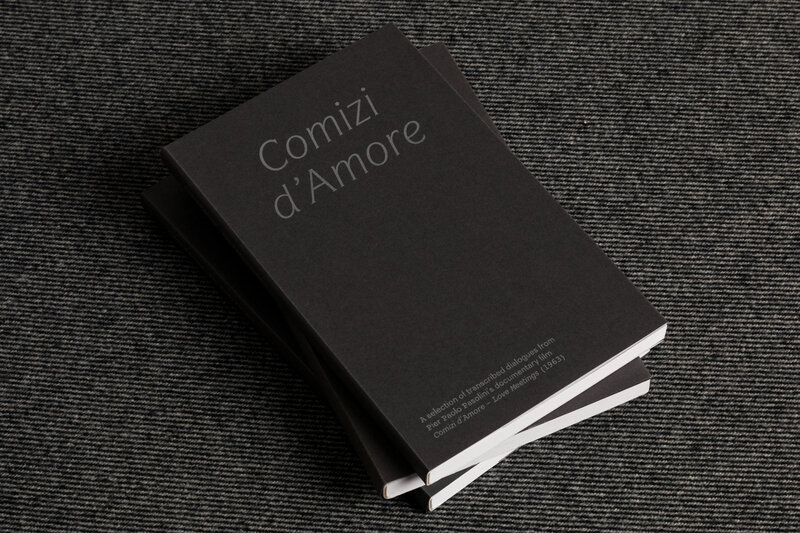 The front cover was done in shiny, black foil, contrasting the uncoated gray paper and suggesting a reference to the italian modernist style featured in the exhibition. 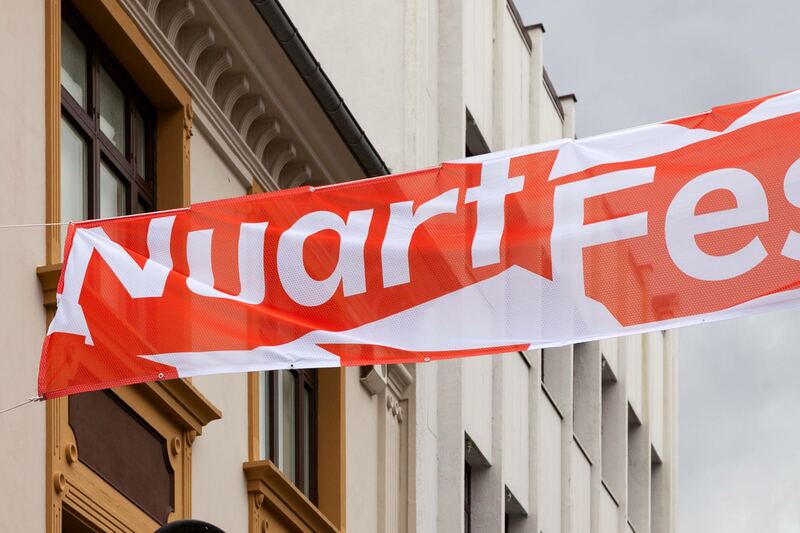 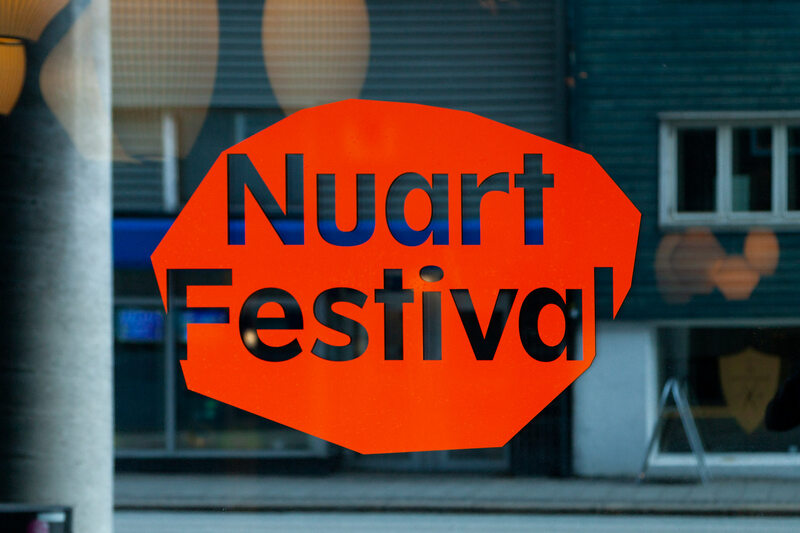 2018 marked the sixth year of our collaboration with Nuart Festival, and our third iteration of the current visual identity. 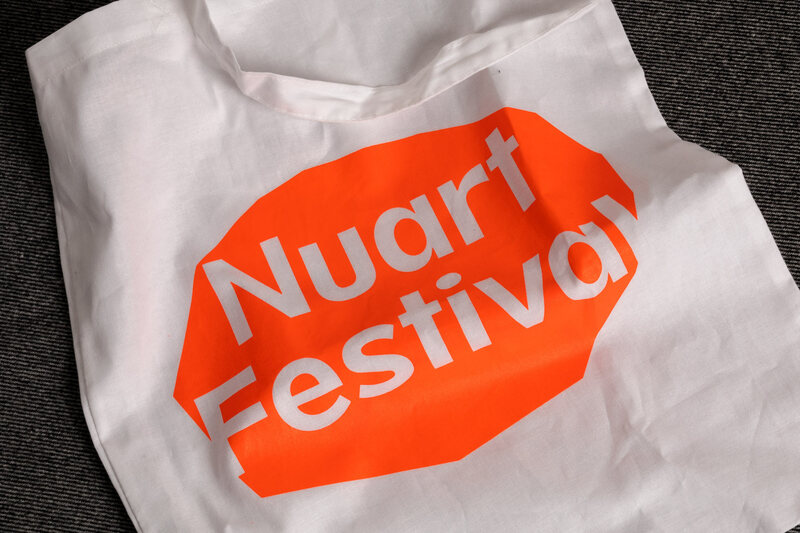 Having previously been re-shaped each year, this time we laid the groundwork for a more permanent visual identity for the festival. 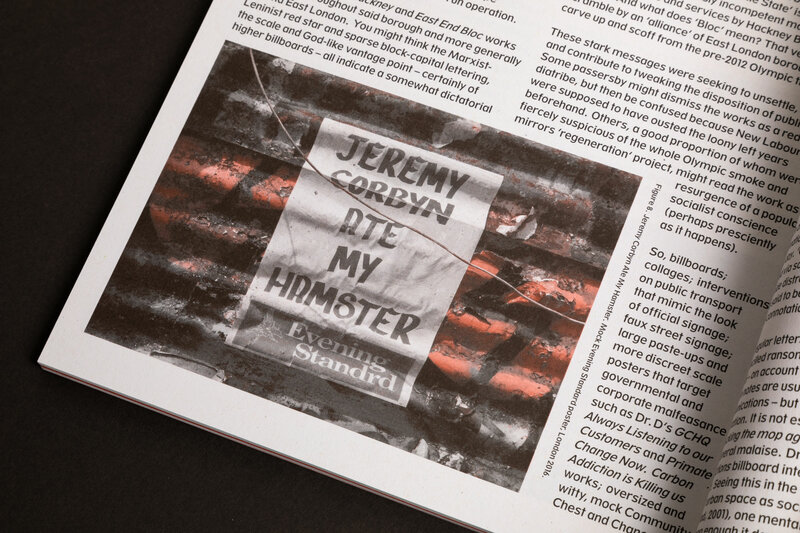 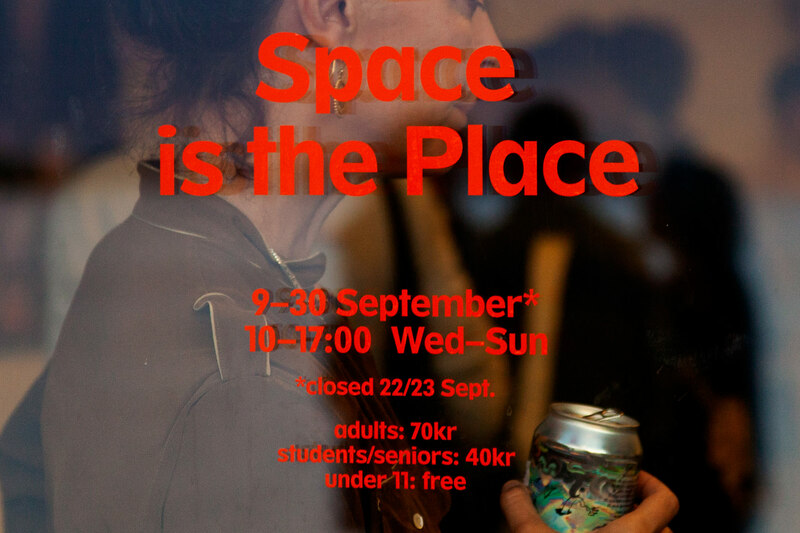 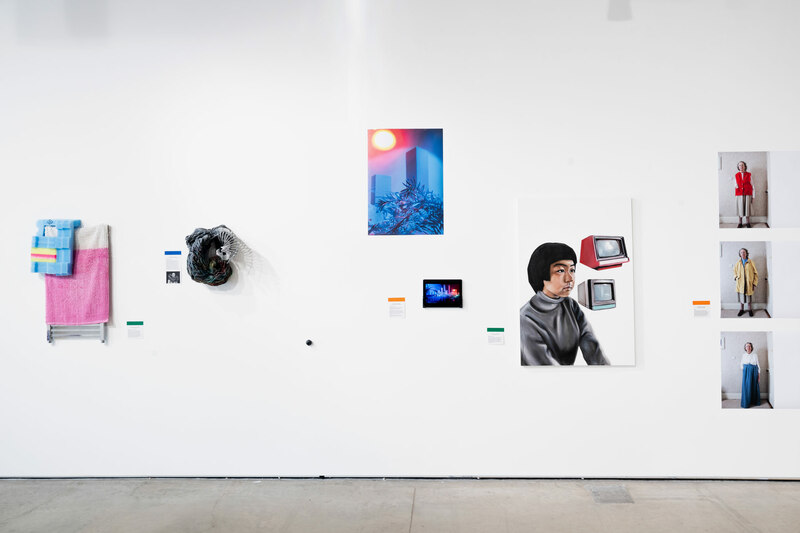 The visual concept builds on our work from previous years, where we – using computer software as our default tool for designing – do our own interpretation of the cut-outs, speech bubbles, and collage/décollage techniques found in the visual output of the Punks and Situationists. 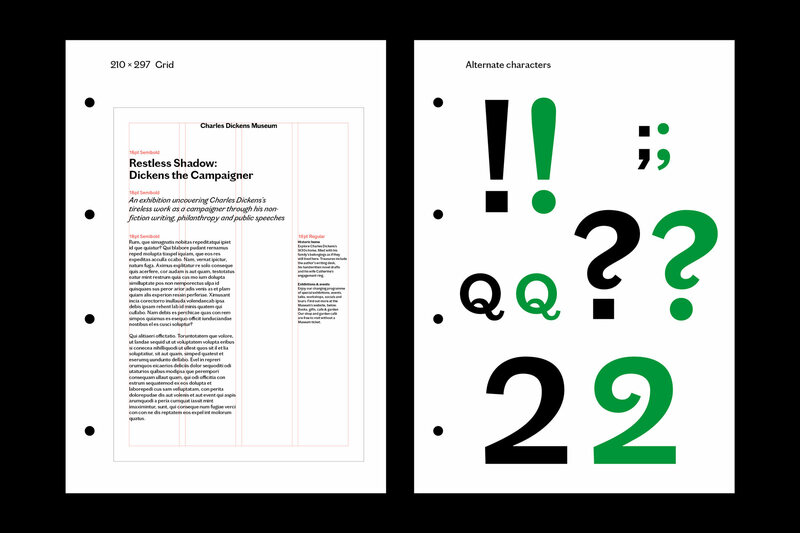 As well as having defined a logo and colour palette, we introduced our new, custom typeface – SB Spartan – to be the defining element of the identity. 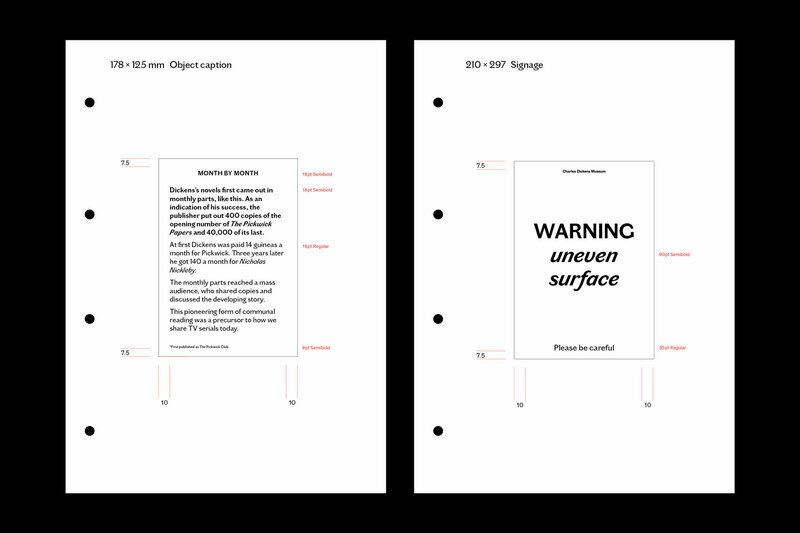 The typeface (drawn by us) builds on Spartan Classified (which we used for the 2017 identity), taking some core visual cues from the original and re-making it into a more usable, full font family. 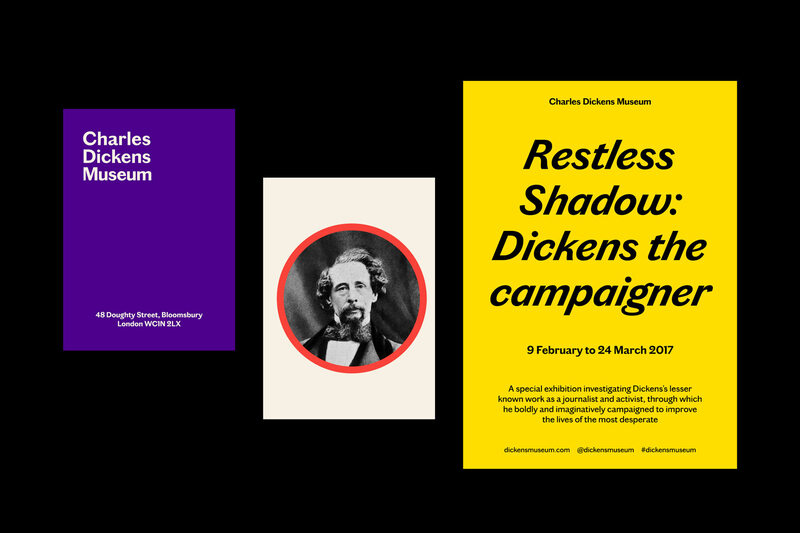 Currently consisting of a Regular and Bold extended latin with italics, it’s still a work in progress, with the aim of expanding to more weights and characters as the identity develops over time. 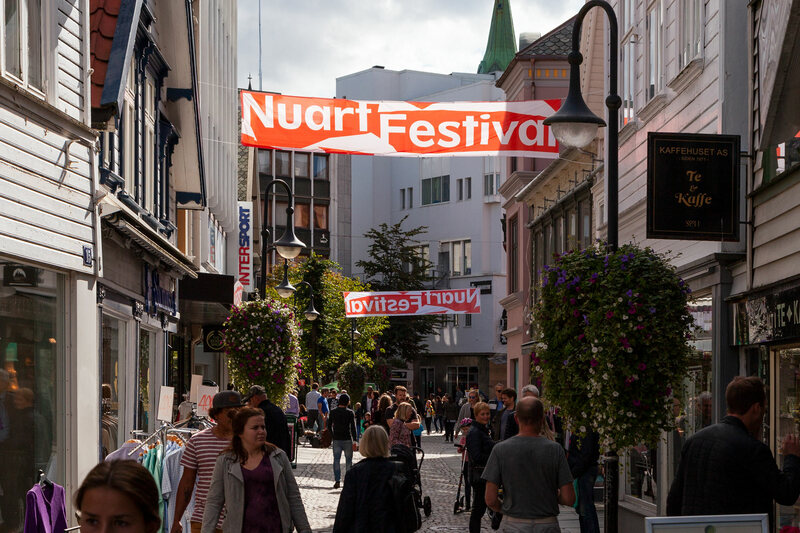 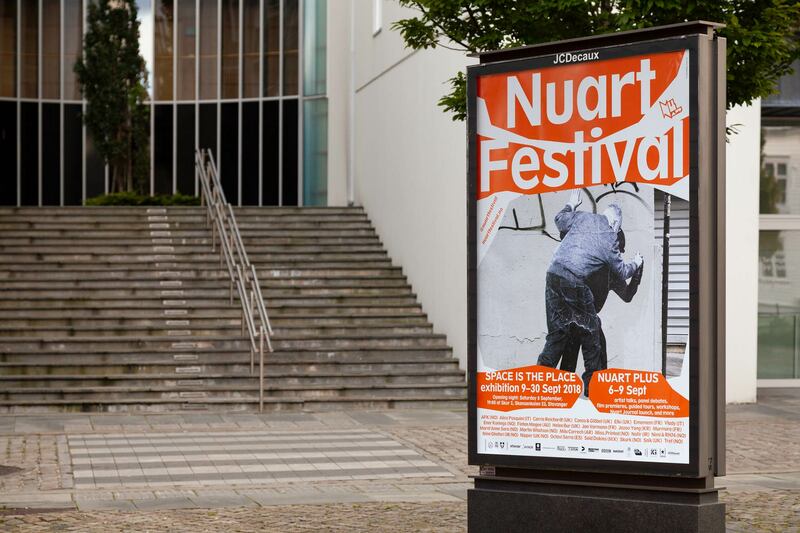 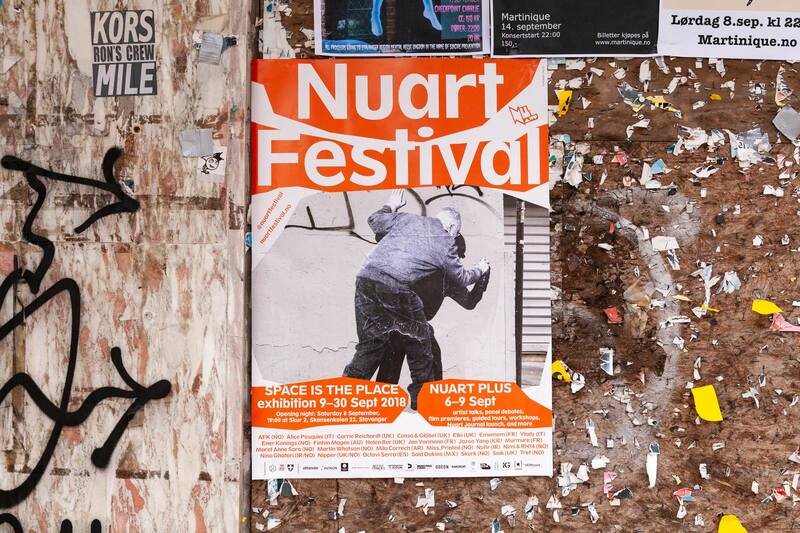 In September 2018, our long time collaborators Nuart Festival launched the Nuart Journal, after first testing the concept as part of the 2017 festival programme. 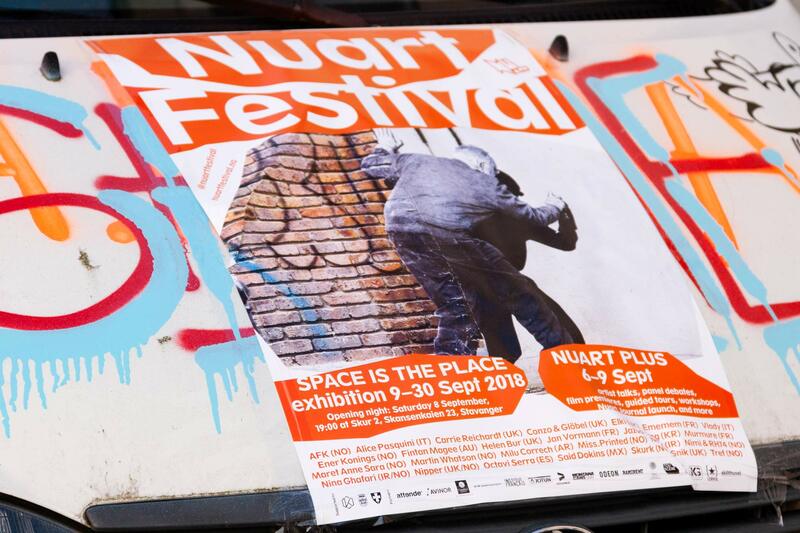 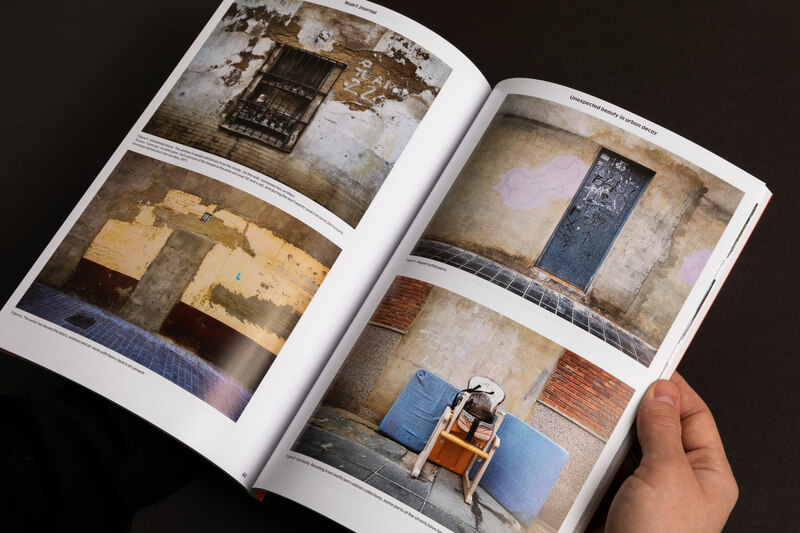 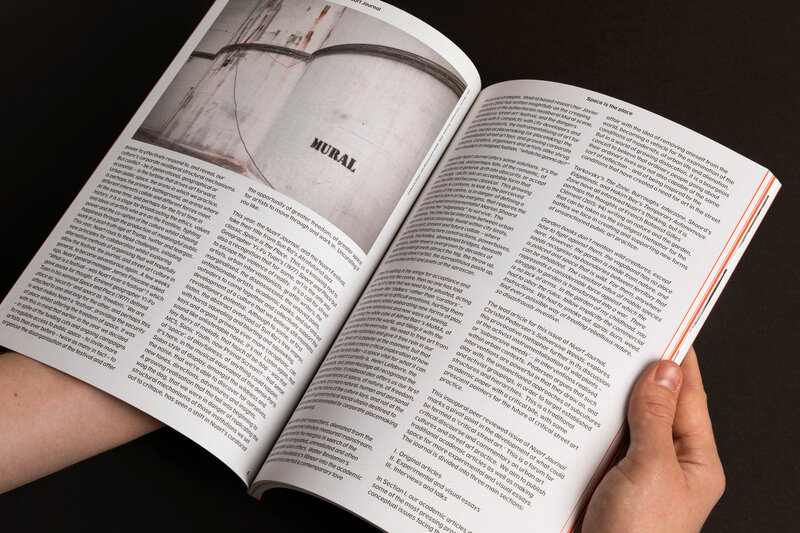 The Nuart Journal ties in with the pre-existing series of academic symposia Nuart Plus, and is a bi-annual, peer-reviewed academic journal publishing provocative and critical writings on a range of topics relating to street art practice and urban art cultures. 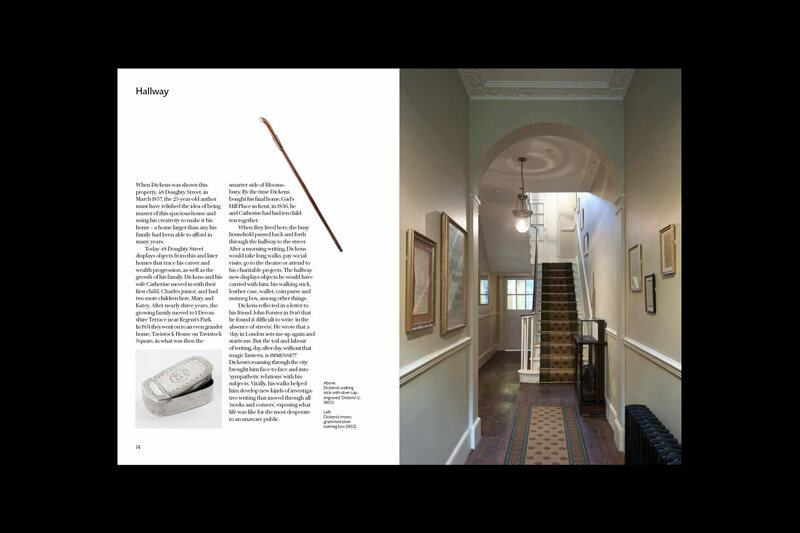 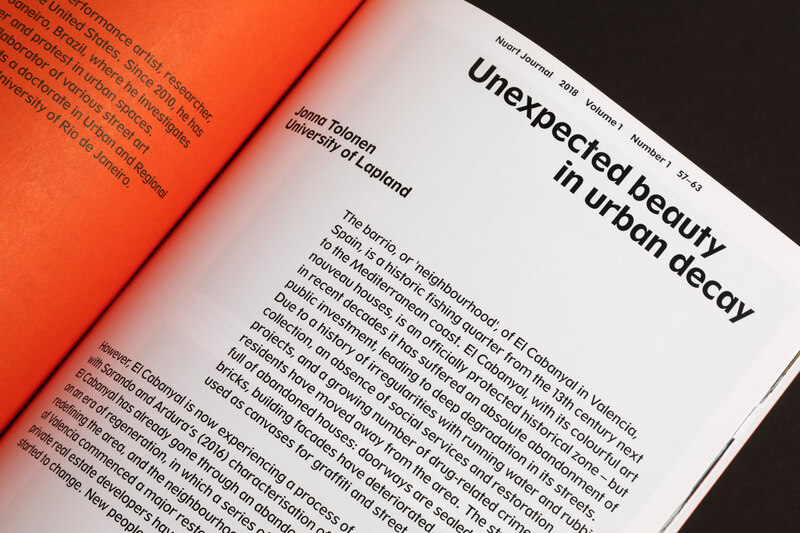 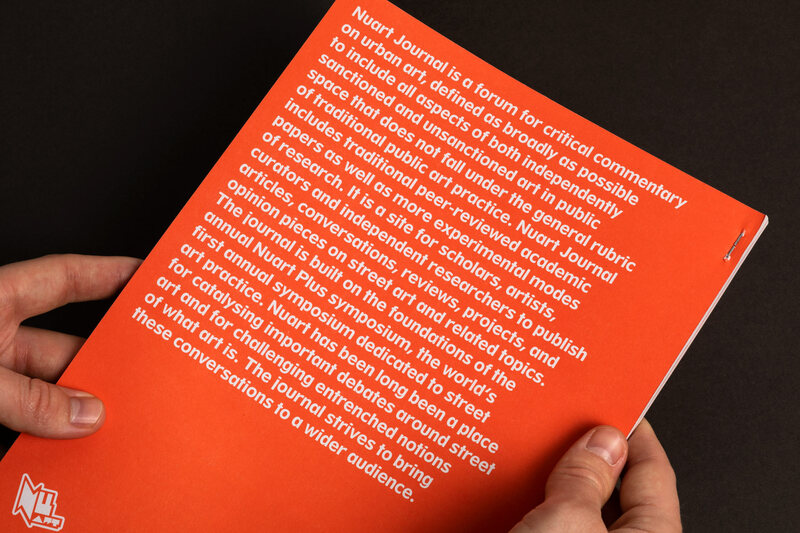 As a first issue, Volume 1 (2018) was a test subject for a journal which will be continually evolving both in terms of design and content. 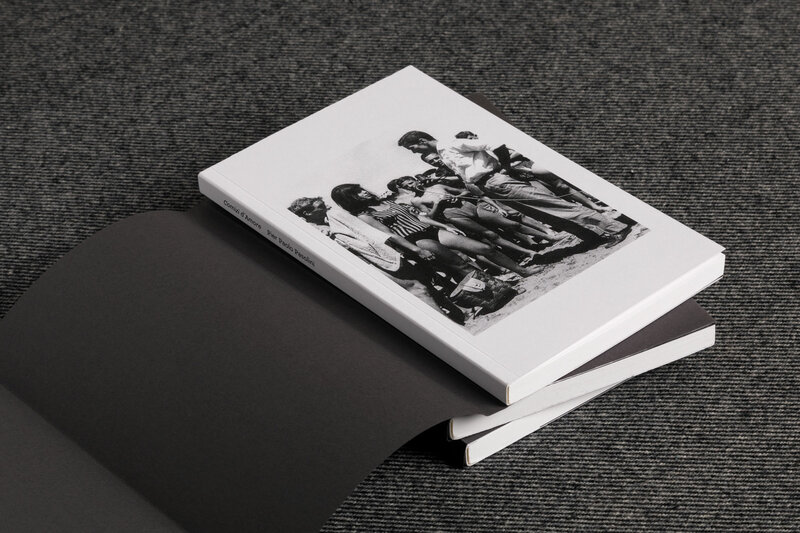 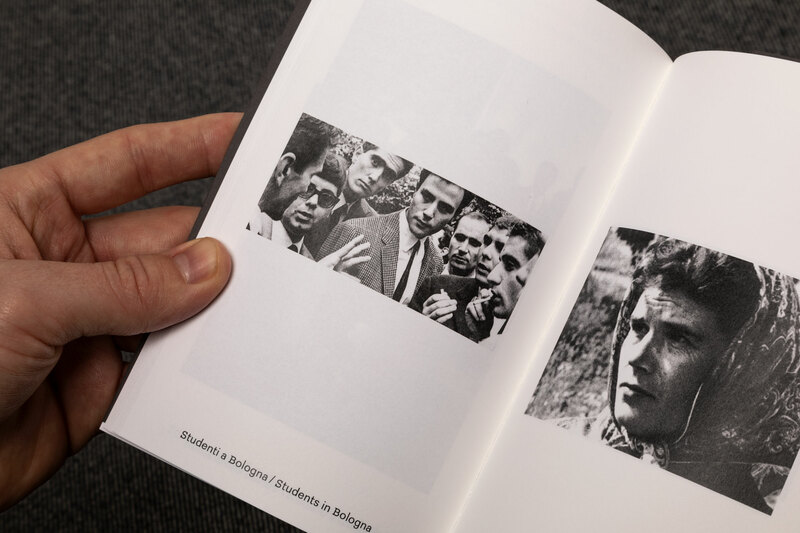 Published in a magazine-sized format with a soft cover and bound by block stapling, it aims to simultaneously adhere to and subvert the typical journal format, continuously referring back to Nuart’s core references, the Punk and Situationist movements. 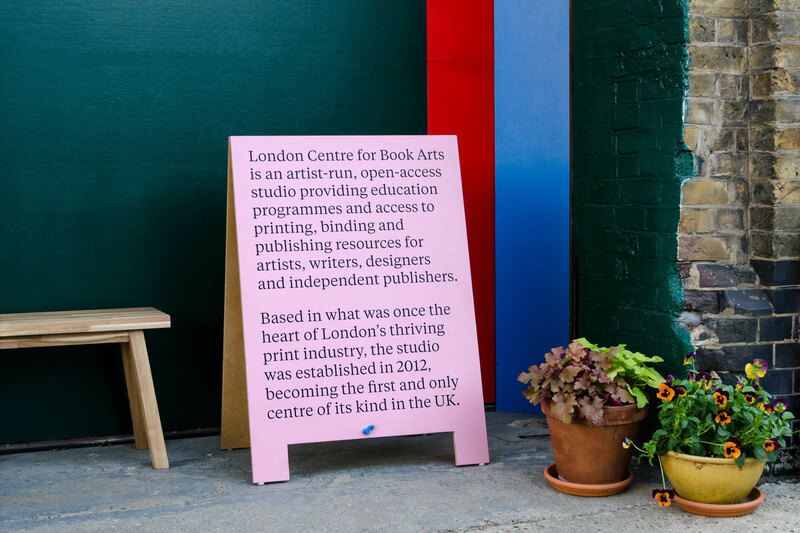 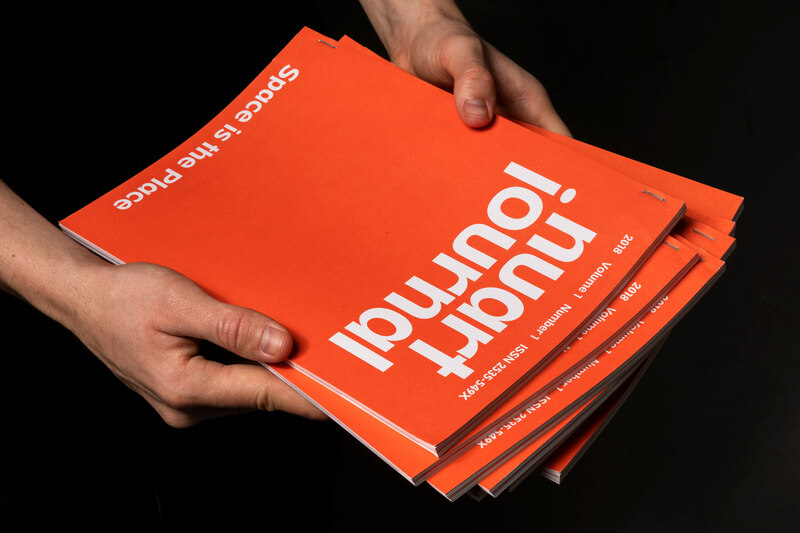 Our good friends and neighbours at the London Centre for Book Arts celebrated their 5th anniversary of existence in 2015, also coinciding with the 50th anniversary of Space Studios. 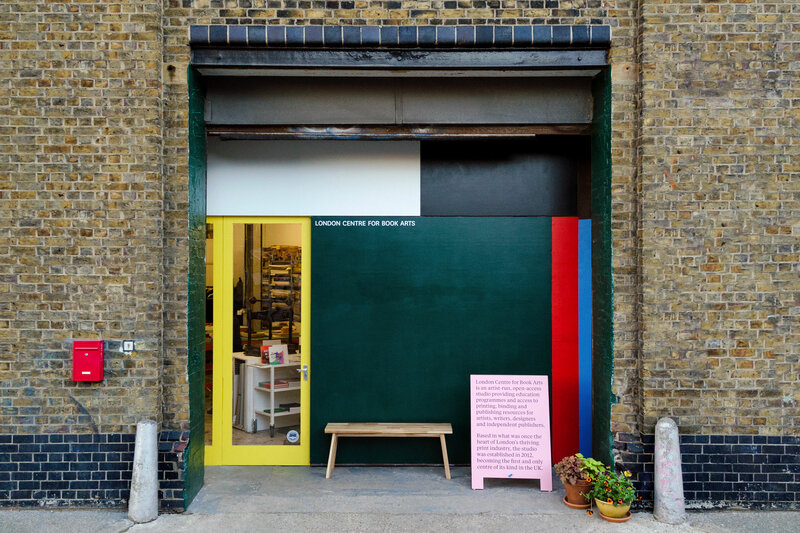 On that occasion, they tasked us with revitalising their shopfront. 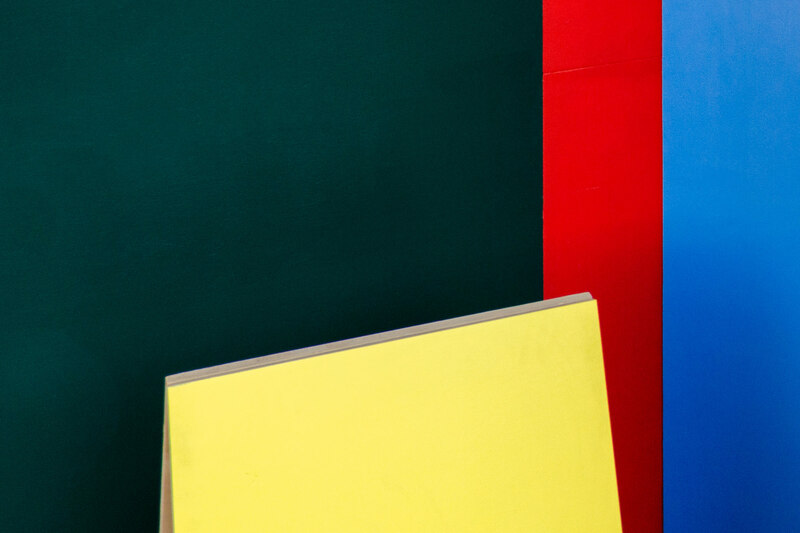 Previously a slightly worn, plain varnished plywood facade, we decided to give it some character by applying seven different colours inspired by the workshop. 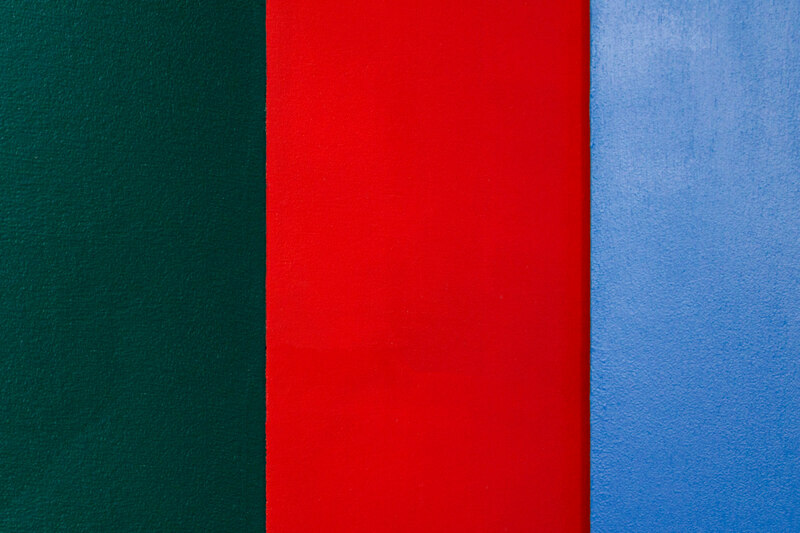 Each panel in the wall was treated as a separate surface, creating an interesting layout of coloured panels, with the desired effect of looking aesthetically pleasing and intriguing without being too flashy. 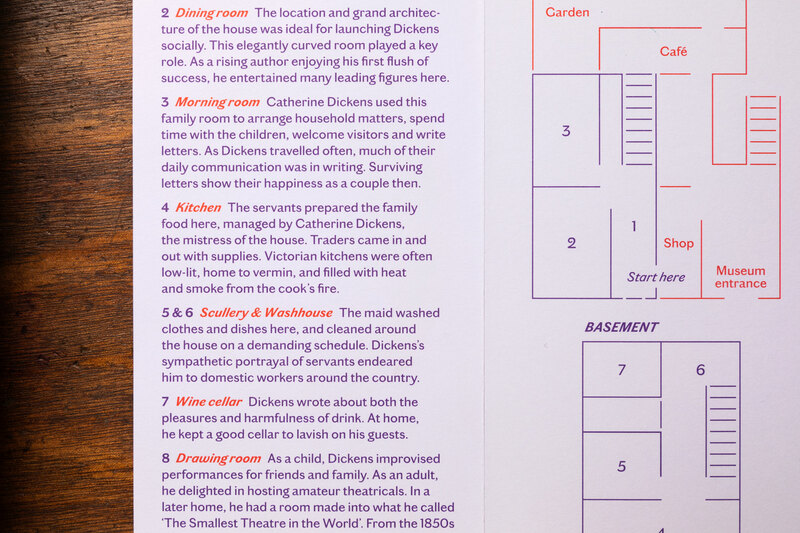 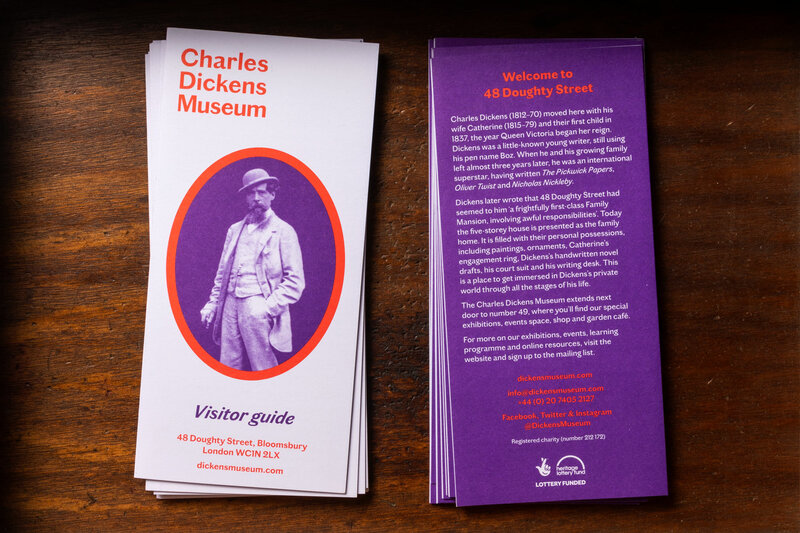 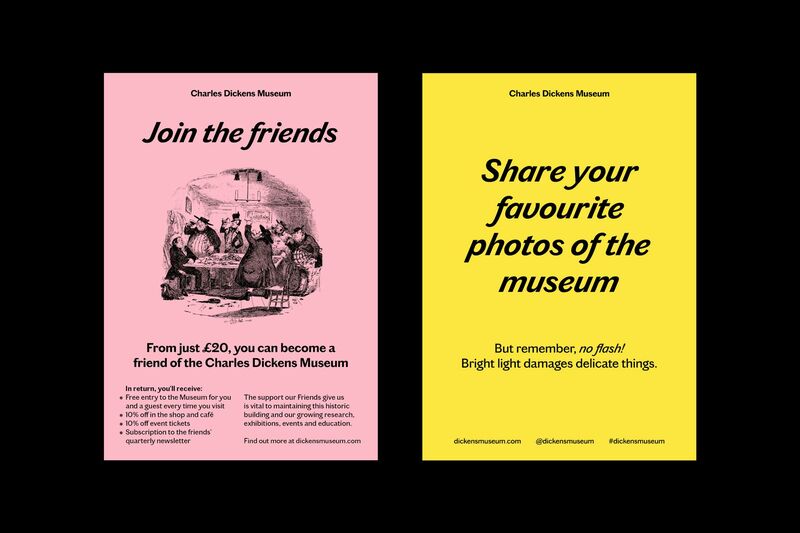 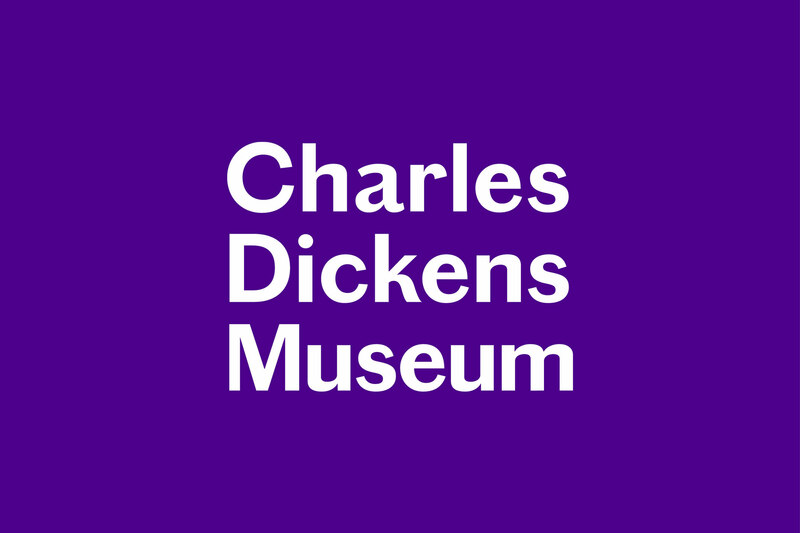 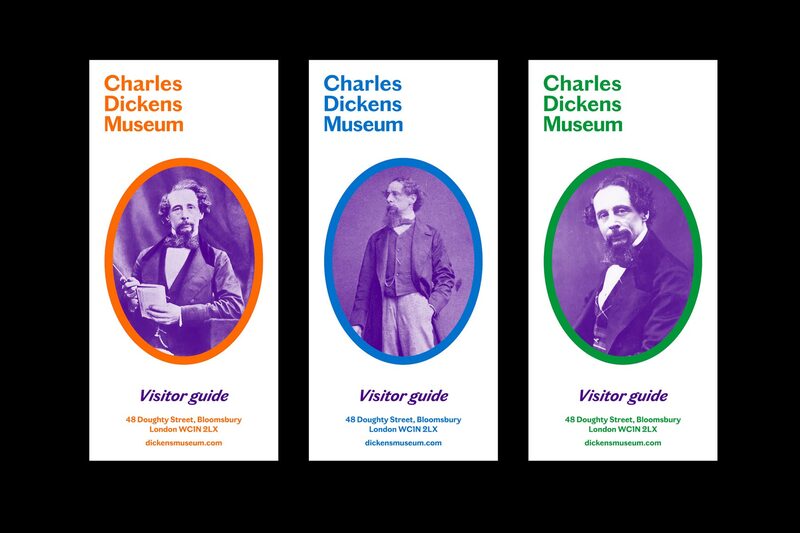 The Charles Dickens Museum in London – also known as 48 Doughty Street – is the only museum dedicated to Dickens in London, and is housed in his Bloomsbury home from which he gained fame writing classics such as the Pickwick Papers and Oliver Twist. 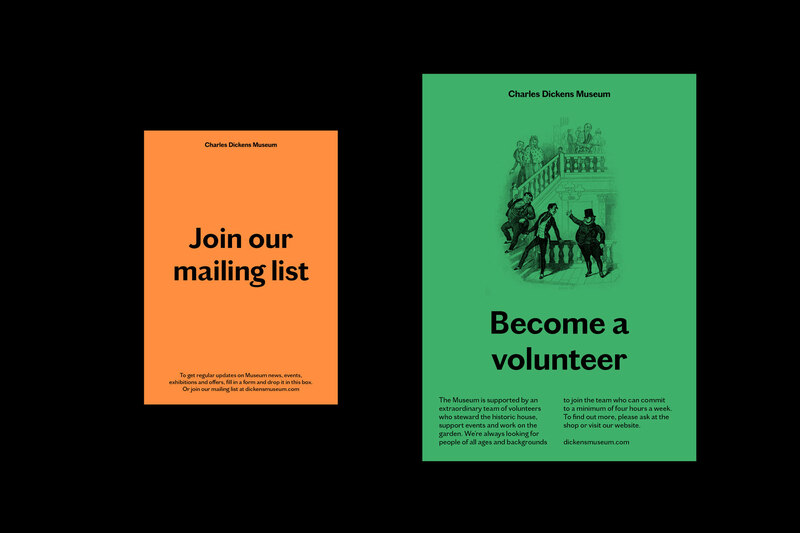 Studio Bergini were approched to give the Museum a full visual revamp, with a new logo, visual identity system, signage, wayfinding, and exhibition displays. 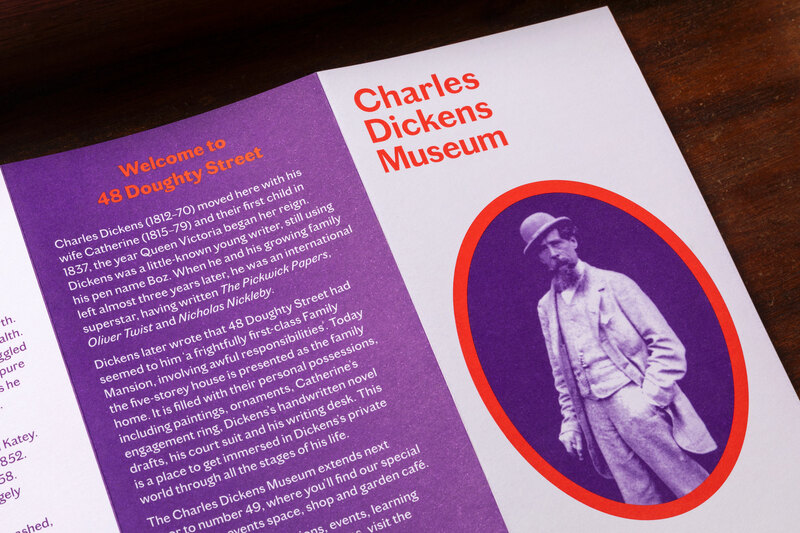 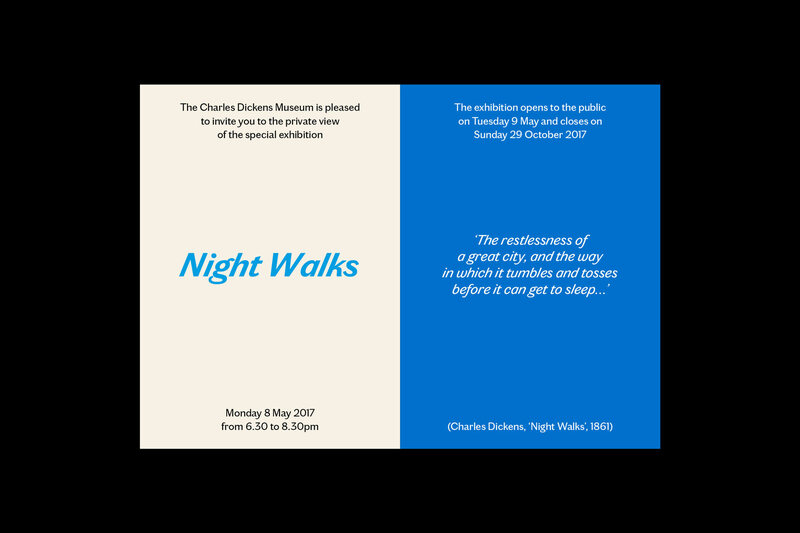 By using research into the personality and personal style of Dickens as a base, the identity avoids nostalgic pastiche of Regency and Victorian styles by introducing vibrant colours and bold shapes – accentuated by the use of Chiswick Grotesque, a recent typeface by Paul Barnes which references the same kind of British Vernacular lettering that would have been found in the streets of London in Dickens’s time. 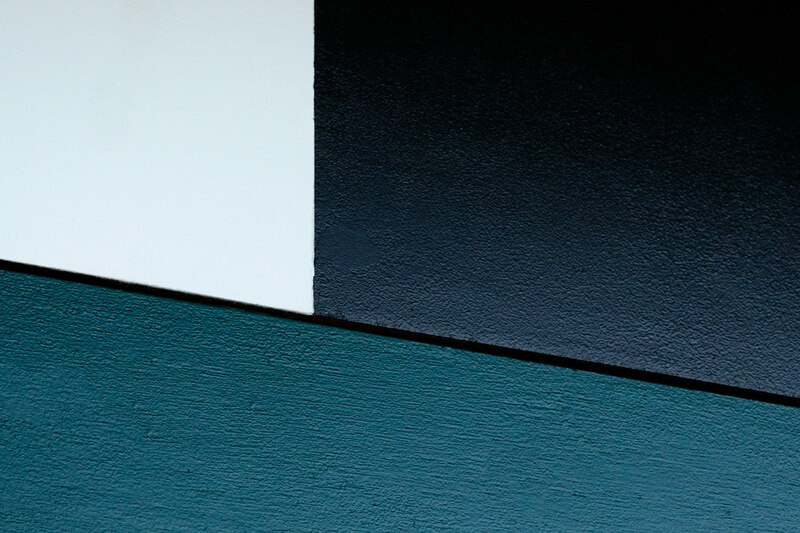 Implementation is still in progress — more updates coming soon. 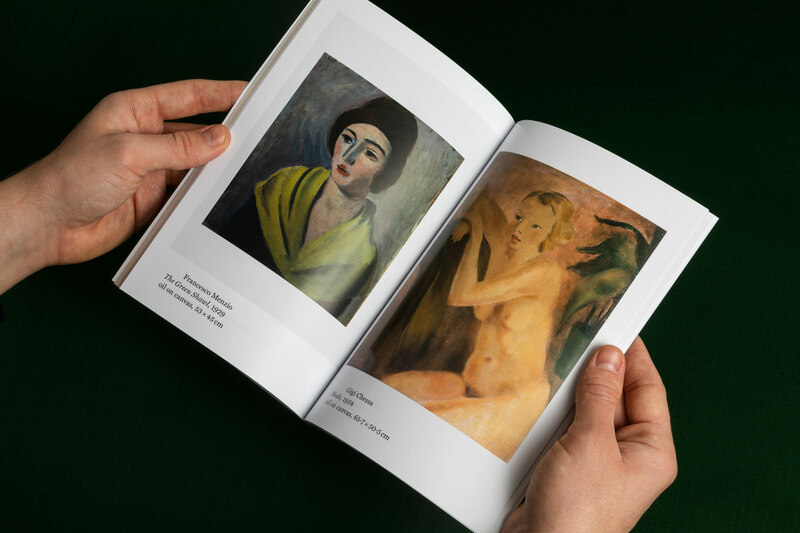 A New Figurative Art 1920–1945: Works from the Giuseppe Iannacone Collection was an exhibition at the Estorick Collection of Modern Italian Art in London featuring artworks from the collection of Giuseppe Iannaccone – one of the most outstanding private collections of Italian art from the inter-war years – showing works by Luigi Broggini, Renato Guttuso, Carlo Levi, Mario Mafai, Aligi Sassu, Scipione and Emilio Vedova, Filippo de Pisis, Fausto Pirandello, Ottone Rosai and Lucio Fontana. 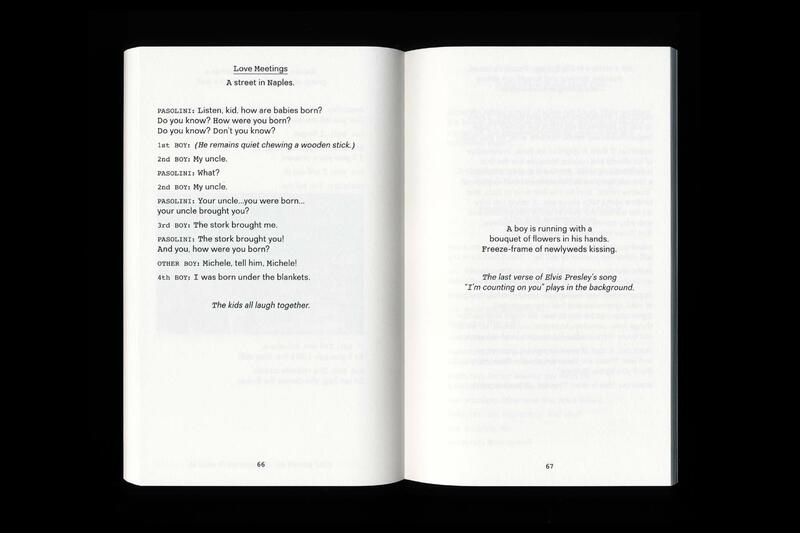 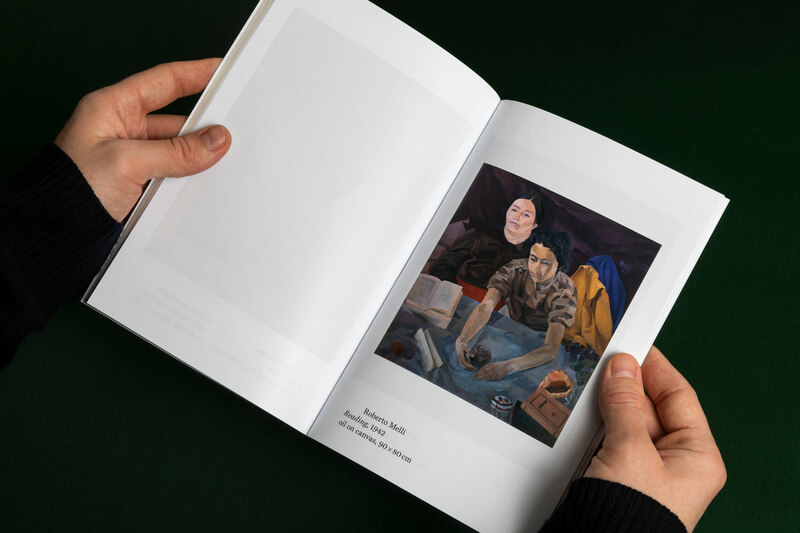 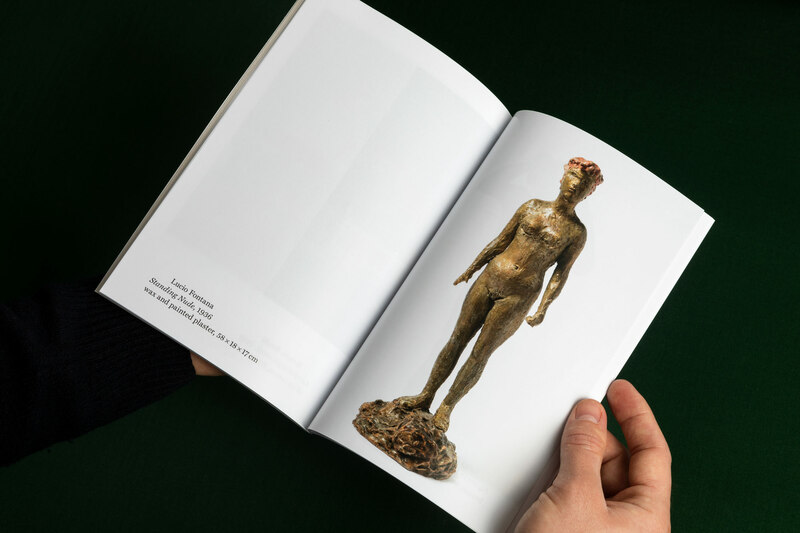 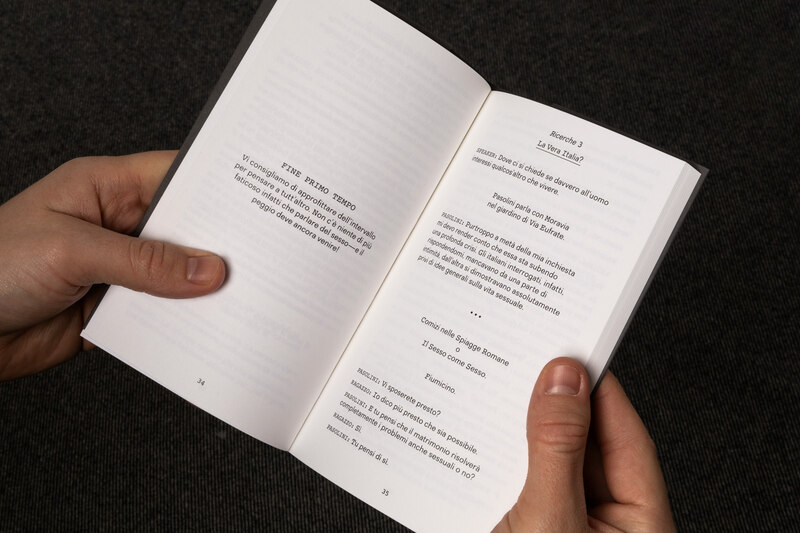 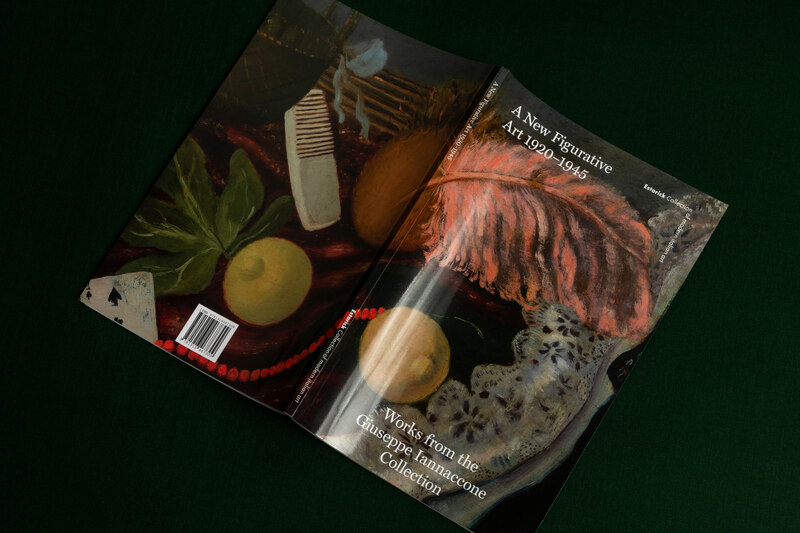 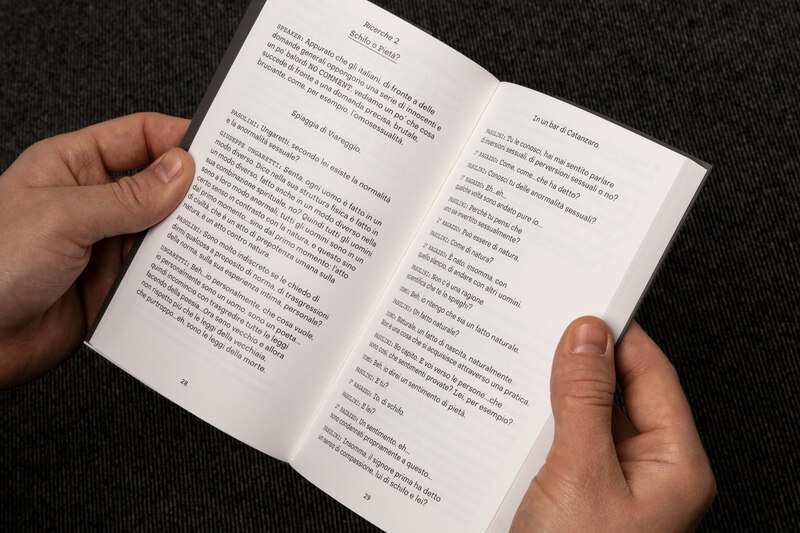 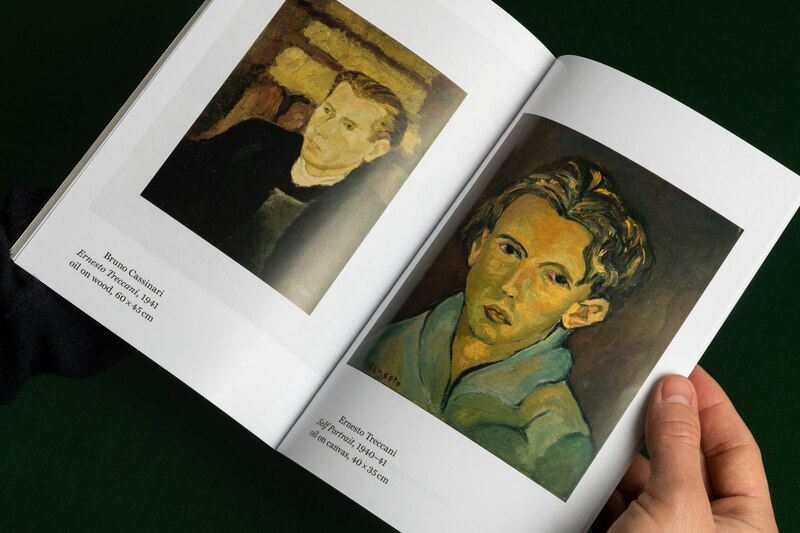 The catalogue is a pocket size book in two sections, with the first section featuring essays from Giuseppe Iannaccone and the curator, and the second containing full colour reproductions of the artworks featured in the exhibition. 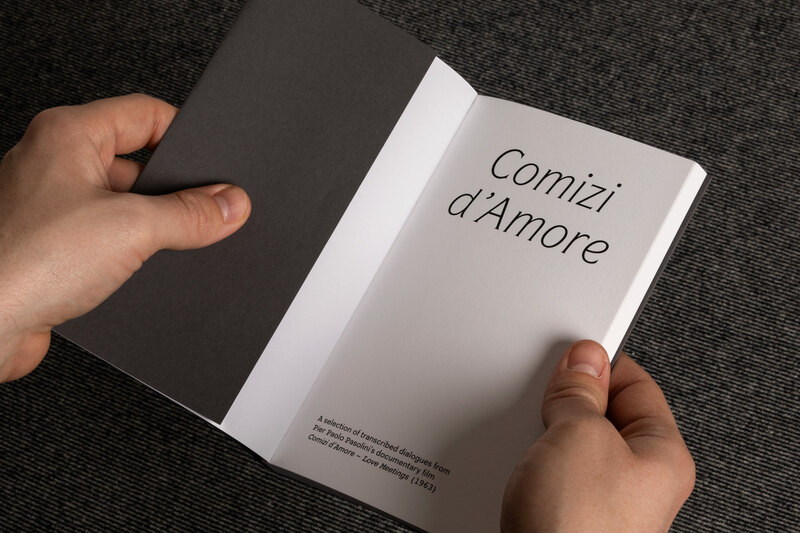 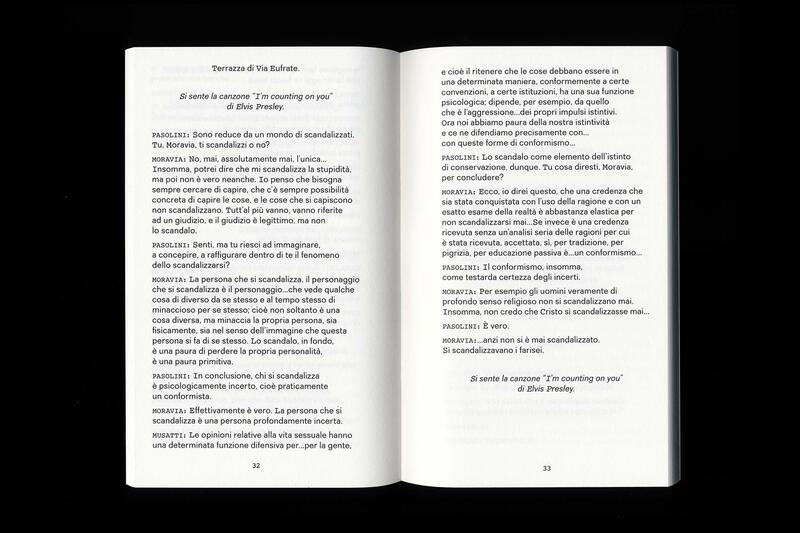 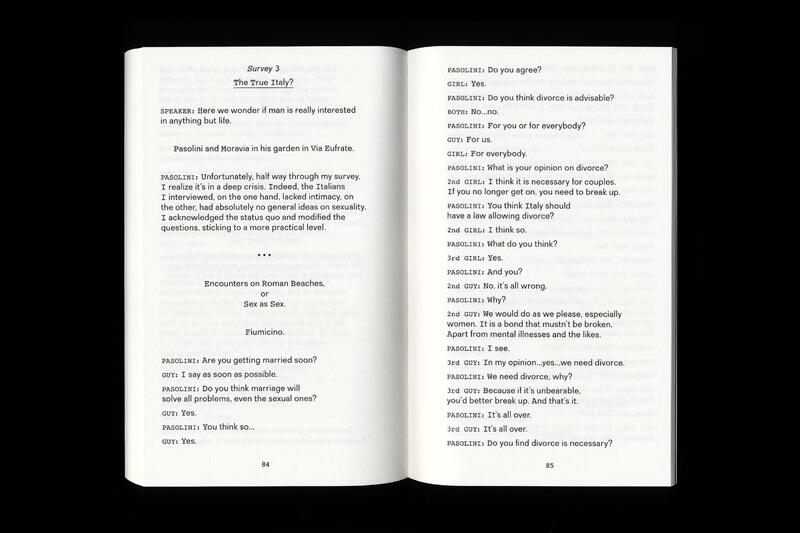 For her graduate exhibition at CCS Bard in Hudson Valley, New York, Marta Cacciavillani approached us for the design of her exhibition identity and the book Comizi d'Amore (love meetings) – a transcript and English translation of selected dialogues from the film with the same title by the Italian director, poet, and intellectual Pier Paolo Pasolini. 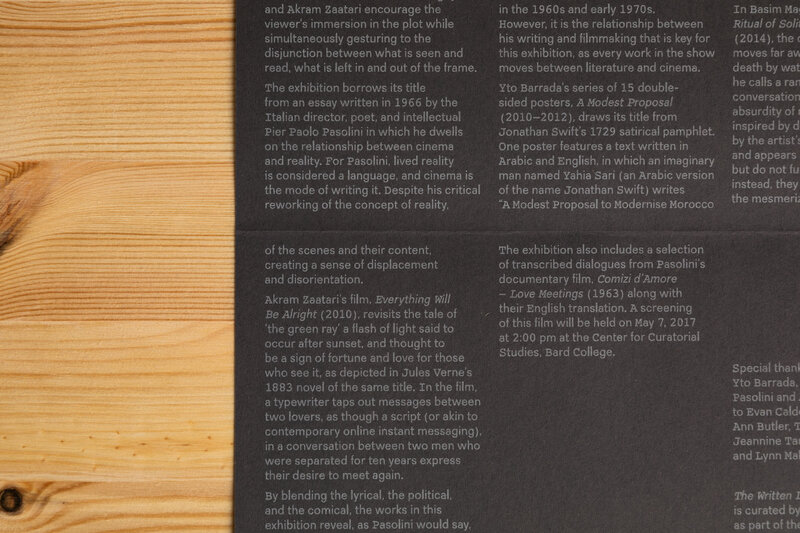 The exhibition took its title from an essay written in 1965 by Pasolini. 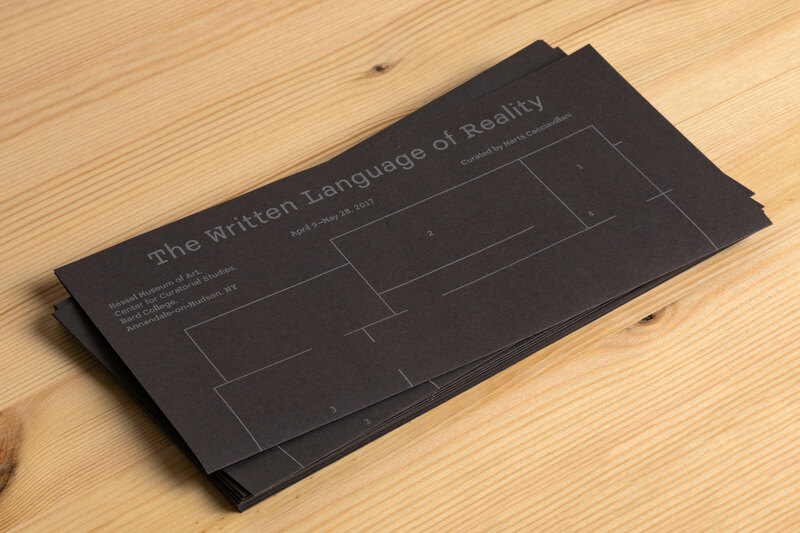 The Written Language of Reality grapples with questions of realism and actuality. 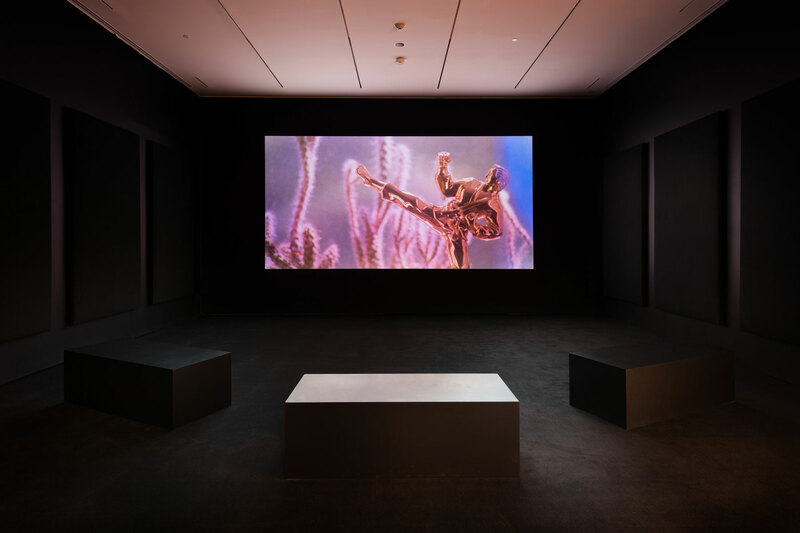 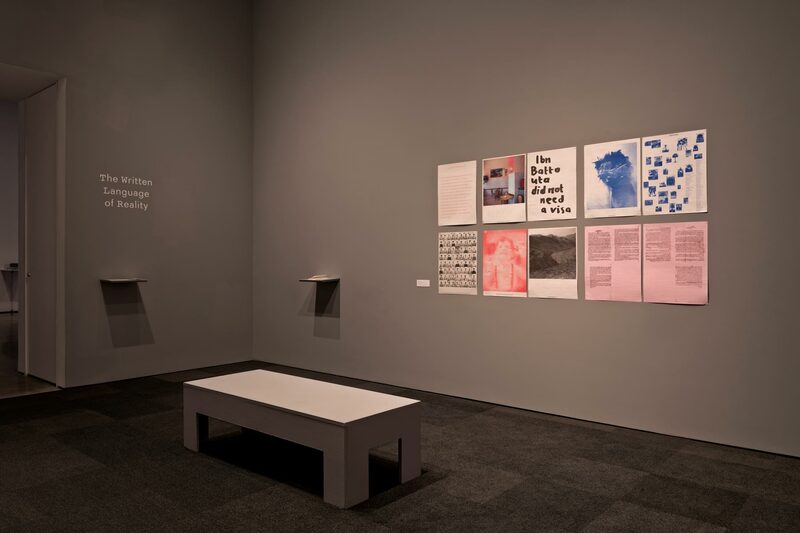 The exhibition brought together a group of works by Yto Barrada, Basim Magdy, and Akram Zaatari that staged a complicated, broken relation between image, text, and script. 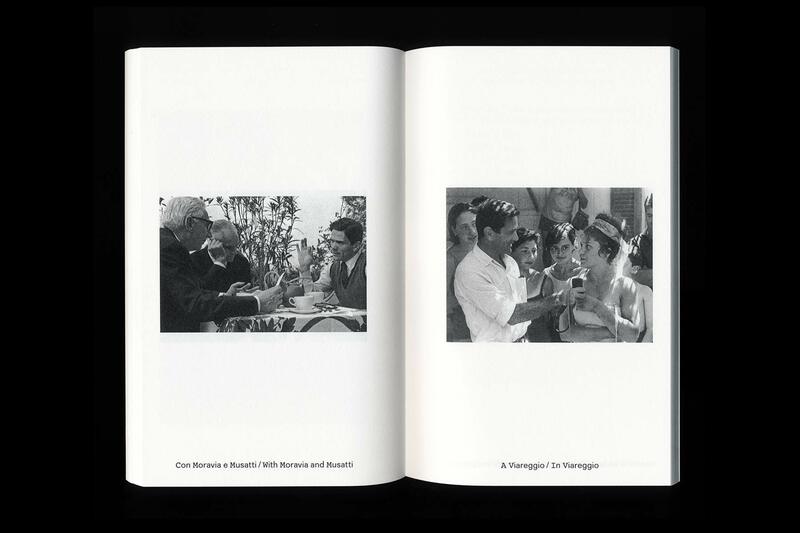 The visual identity – which was applied to the book, wall vinyls, labelling, hand-out, and online promotion – focused on Pasolini’s use of the typewriter (an Olivetti Lettera 22) in his work, and on the standardized style guidelines in which he would have written his movie scripts. 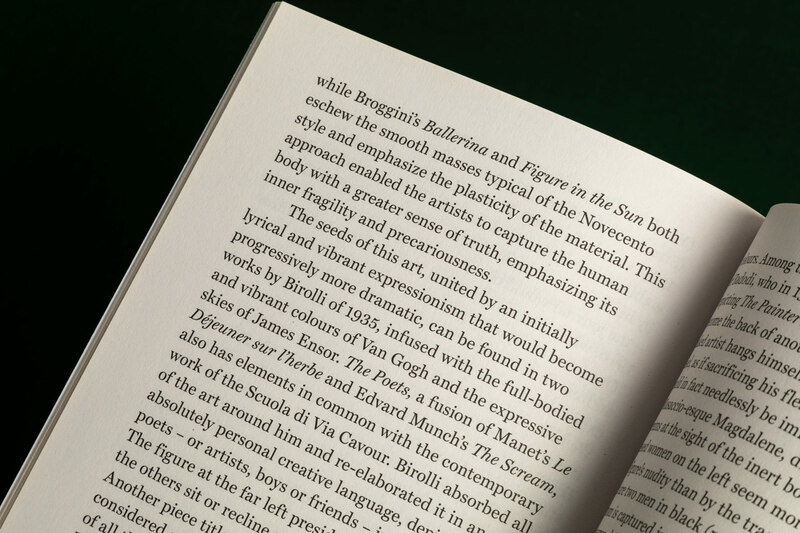 We created a hybrid font for the project, using the international standard font for script writing (Courier) for capitals, numerals, and some punctuation, and mixing it with Recta, a very prominent typeface in 1960s Italy. 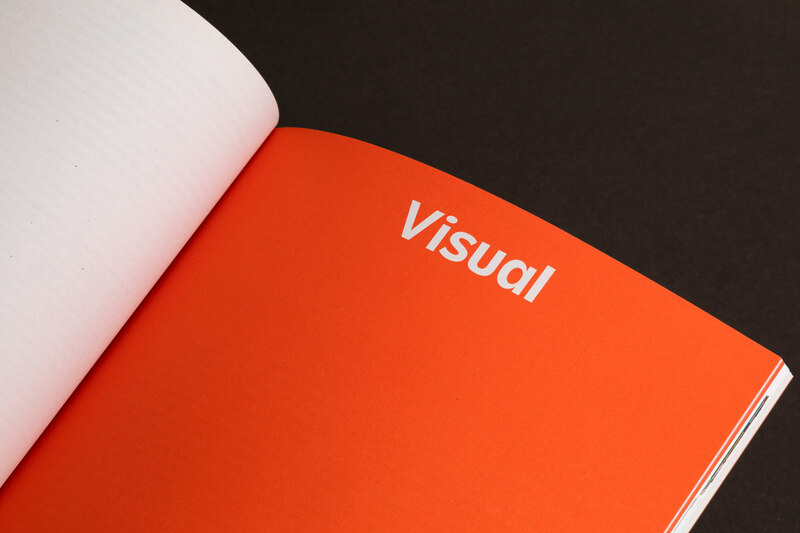 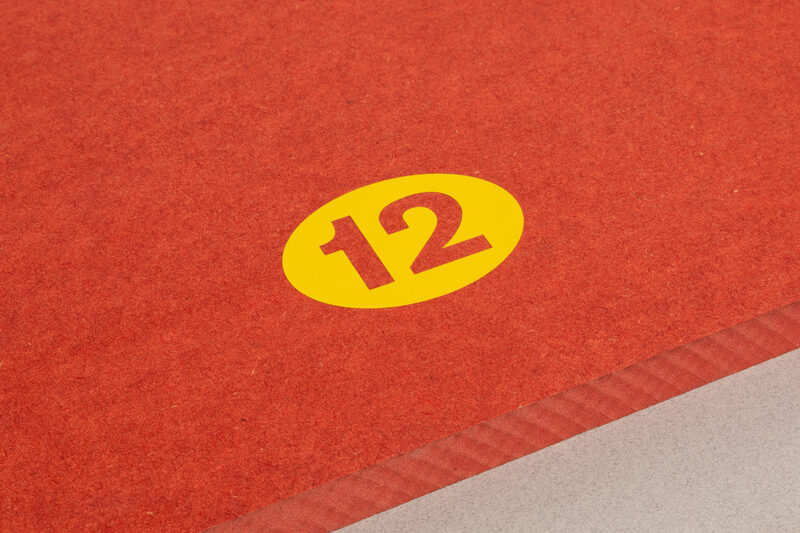 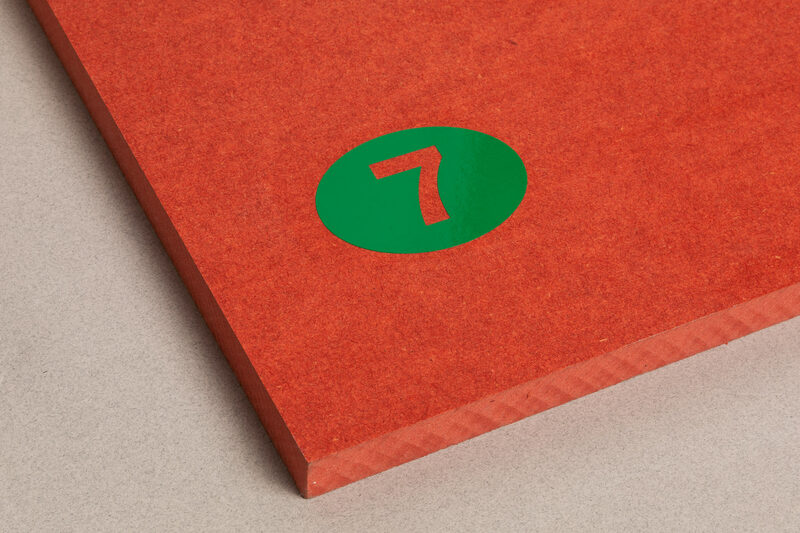 These simple elements created a subtly iconic identity for the exhibition. 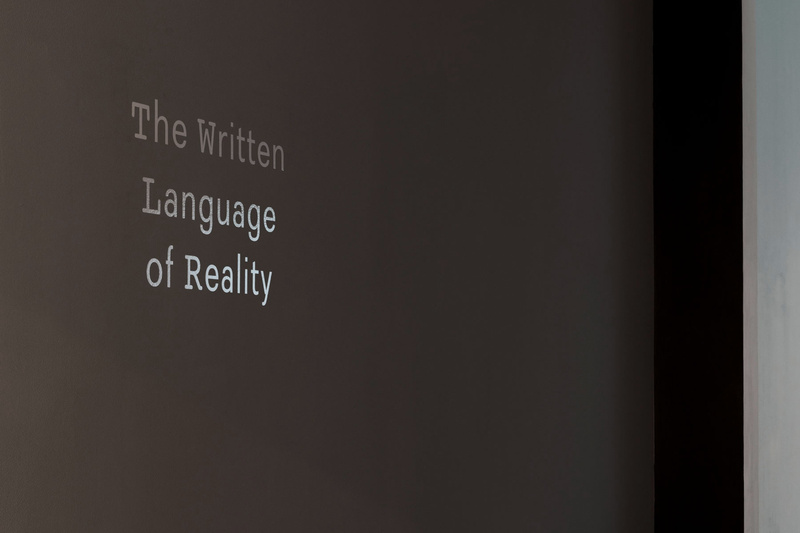 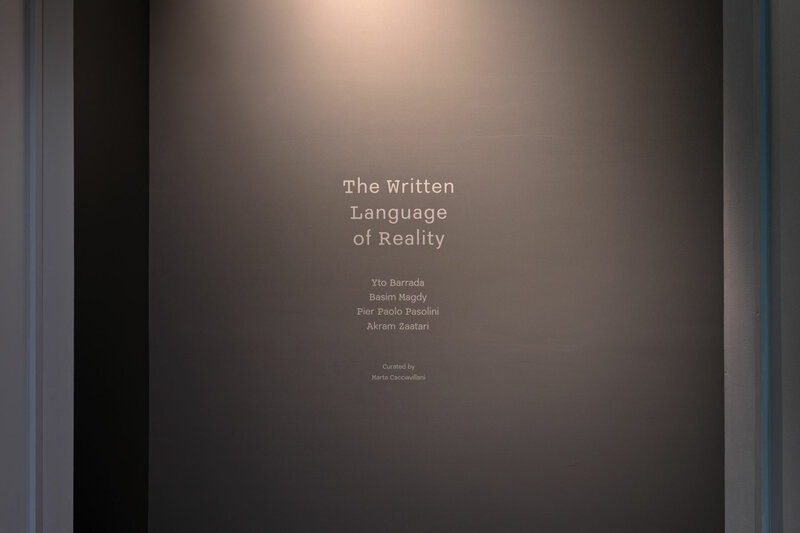 The Written Language of Reality was appeared on 9 April 2017 through 28 May 2017 at the Hessel Museum of Art and CCS Bard Galleries. 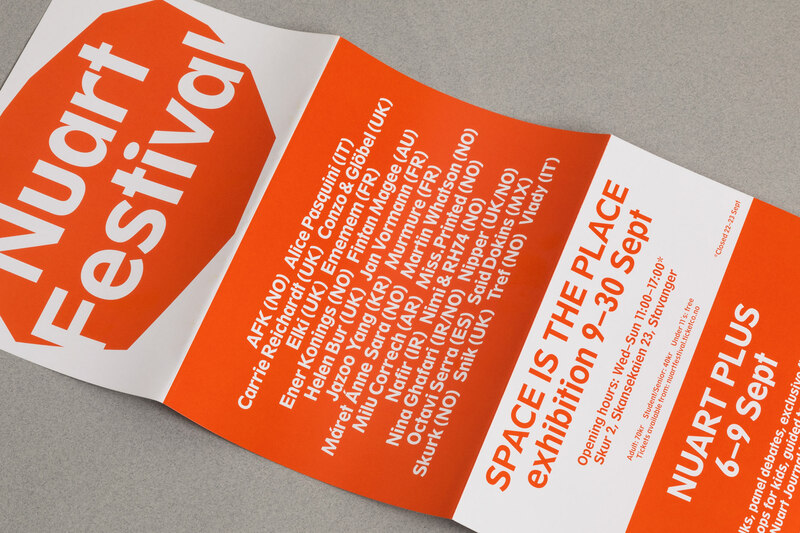 Studio Bergini is a London-based graphic design practice formed by Kristian Hjorth Berge & Francesco Corsini. 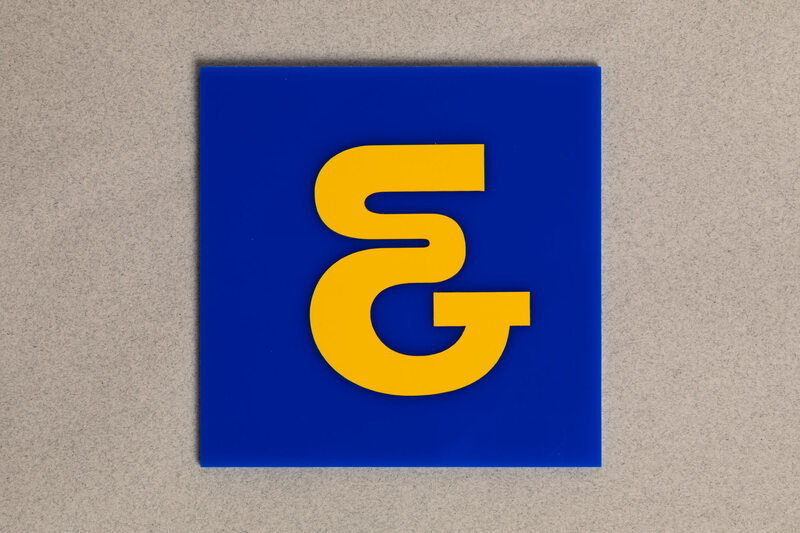 Our work takes a conceptual, informed, content-oriented approach to design, which we bring to all our projects. 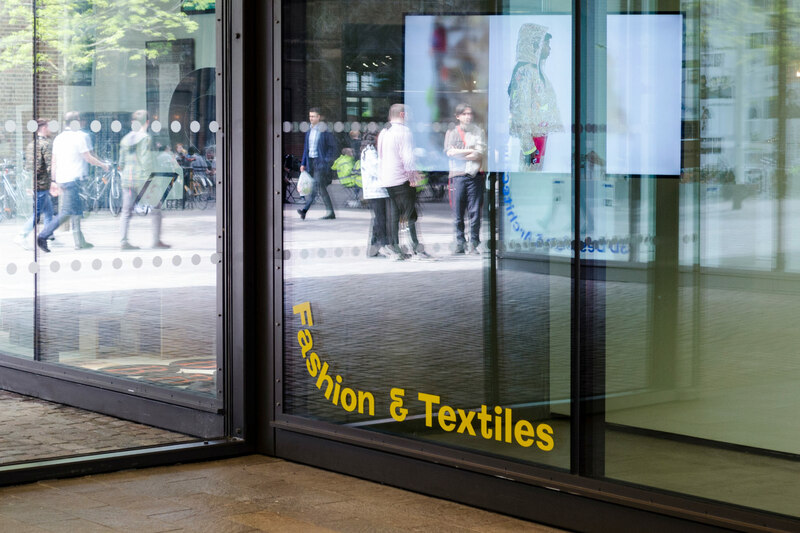 We work across various media for a diverse range of clients, and we’re always on the lookout for exciting jobs and collaborations. 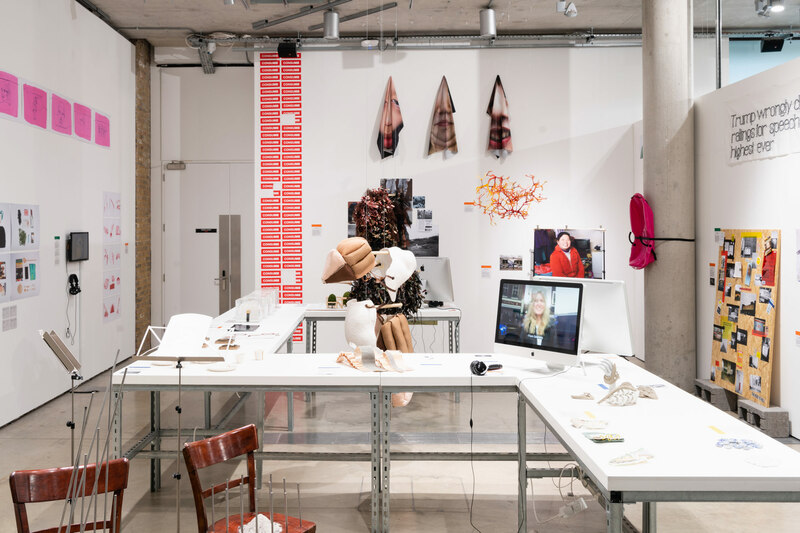 In addition we regularly run educational workshops, most recently at Royal College of Art, Ravensbourne, University for the Creative Arts.